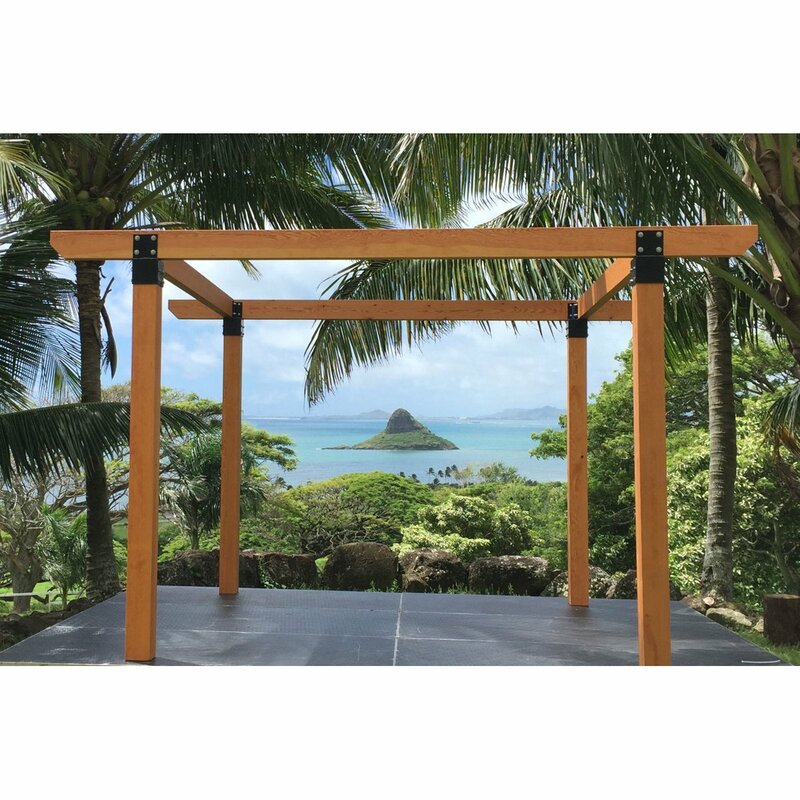 This page features custom timber post brackets used on the tops and the bottoms of wooden posts. 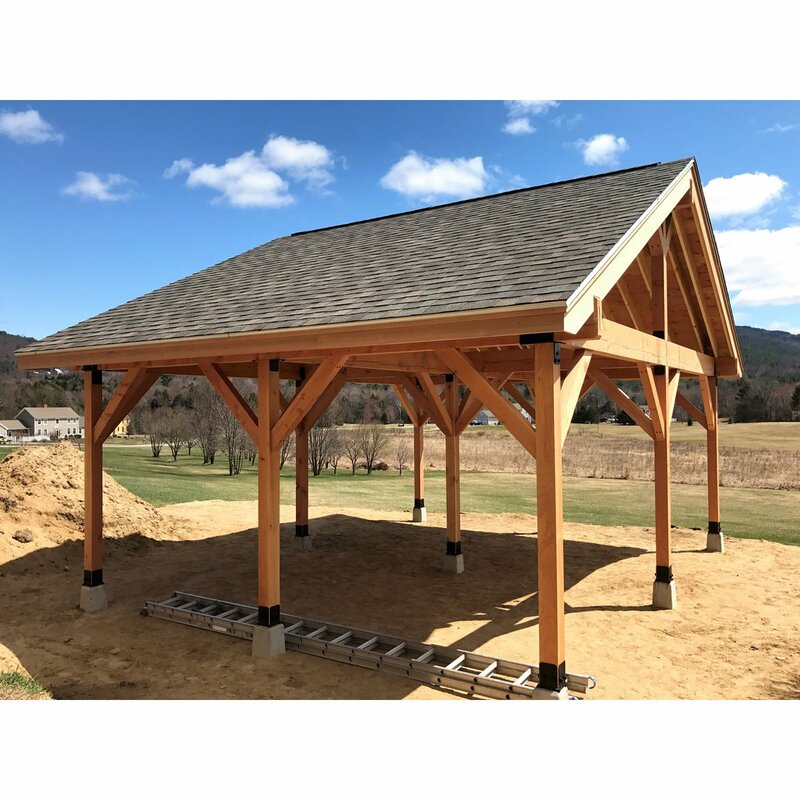 From basic post bases, uplift post brackets, caps that connect beams, to caps that connect multiple beams and posts; we make them all in any design you need. 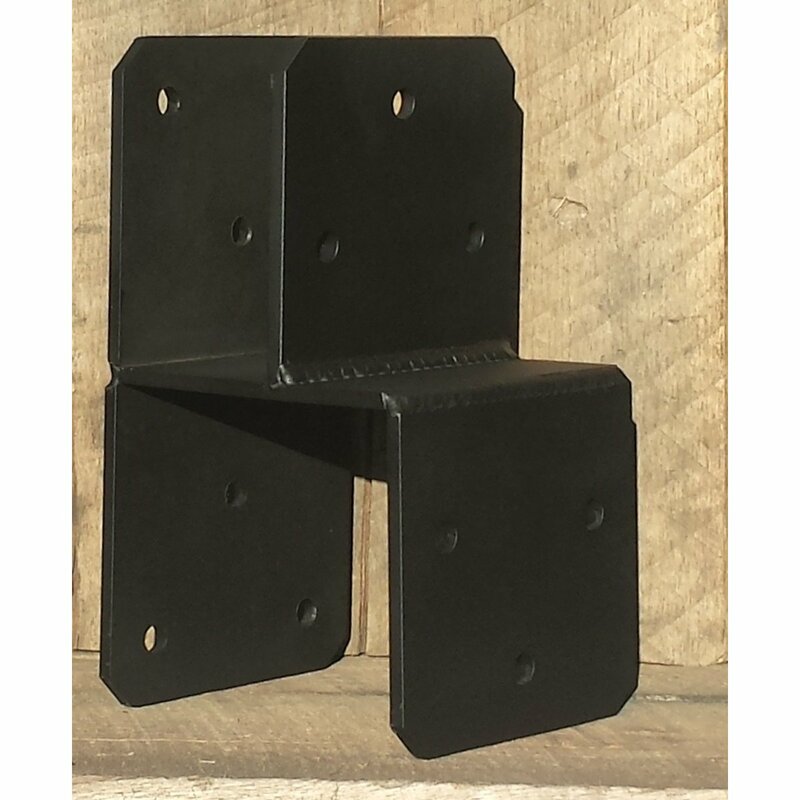 These brackets are great for connecting all types of beams and posts used by: rustic timber framing, porches, pergolas, porticos, gazebos, balconies, decks, pavilions, car ports, barns, rustic homes and cabins. 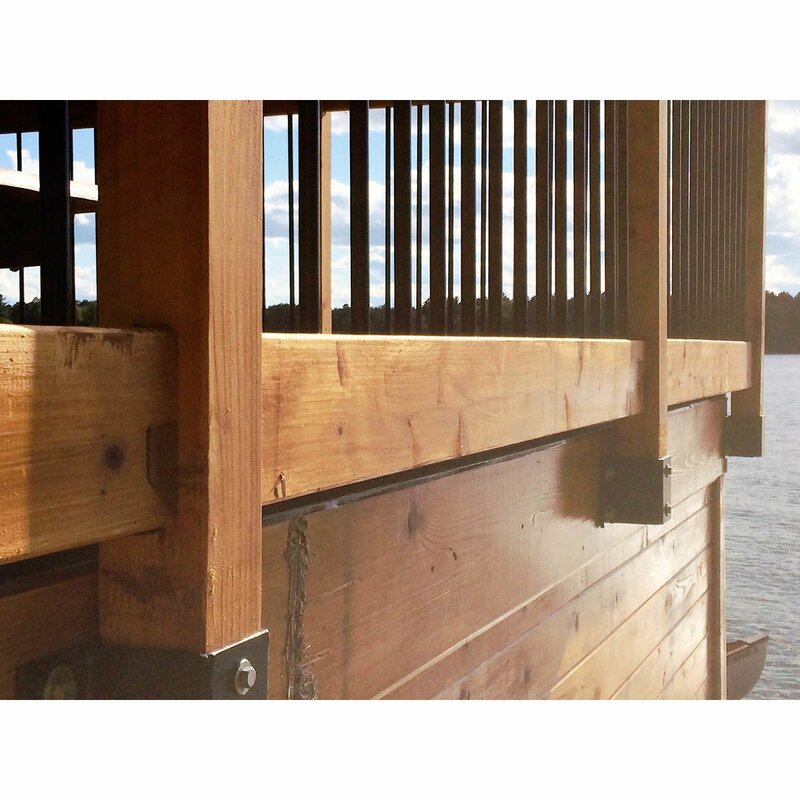 All of our metal work is made to order and is completely custom: the size, thickness, finish, and design elements you choose determine your pricing; so, call us at: (715) 718-0781 for your quote and help designing your next timber building project. 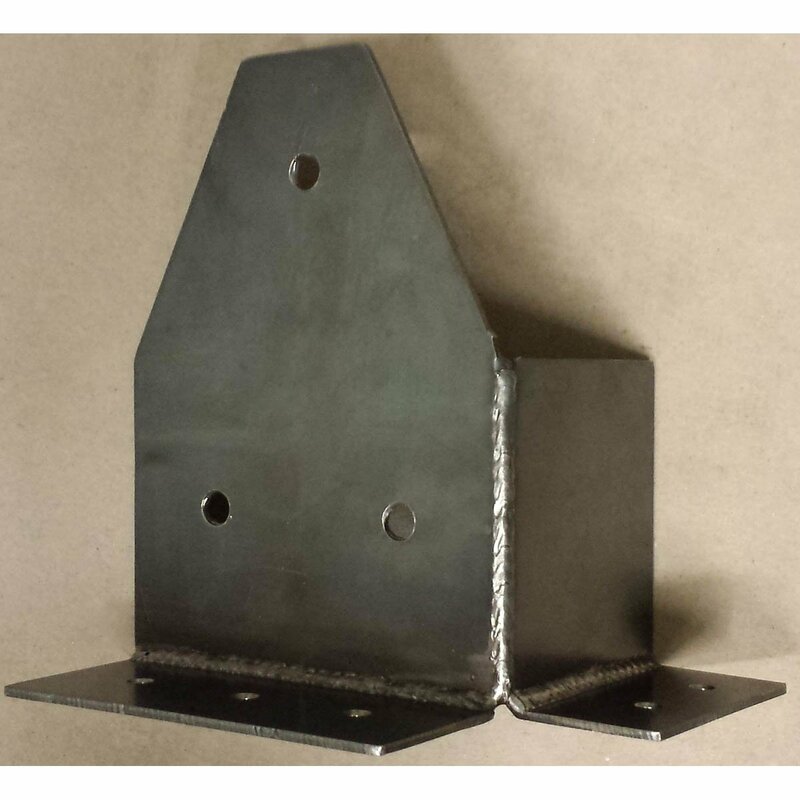 Our custom post to column beam connecting caps are for connecting multiple beams to the top of a column. 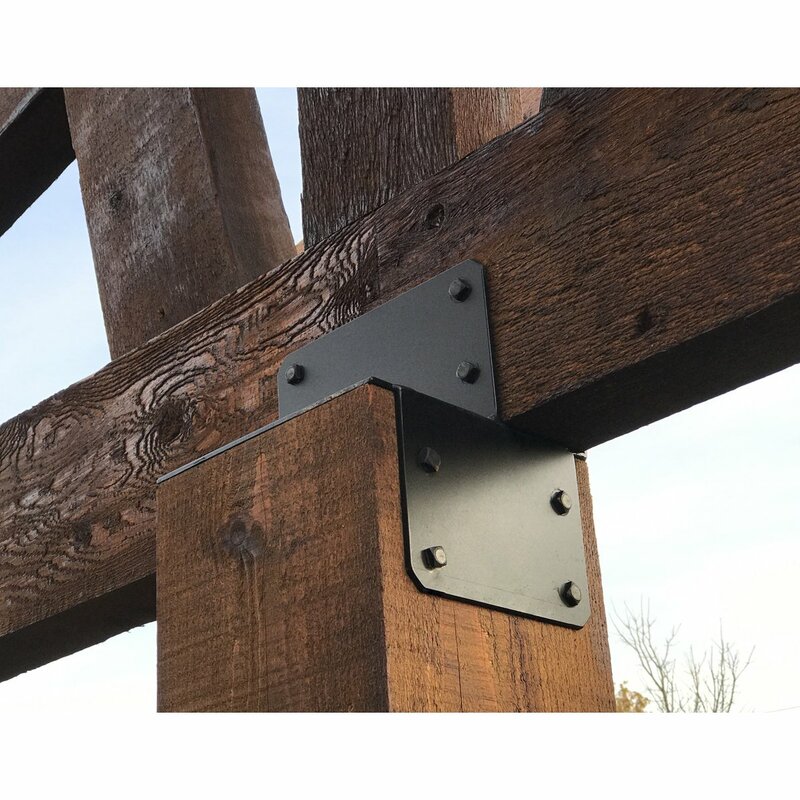 Steel post to beam brackets are great for pergolas, gazebos, timber framing, pavilions, and other timber connection needs. 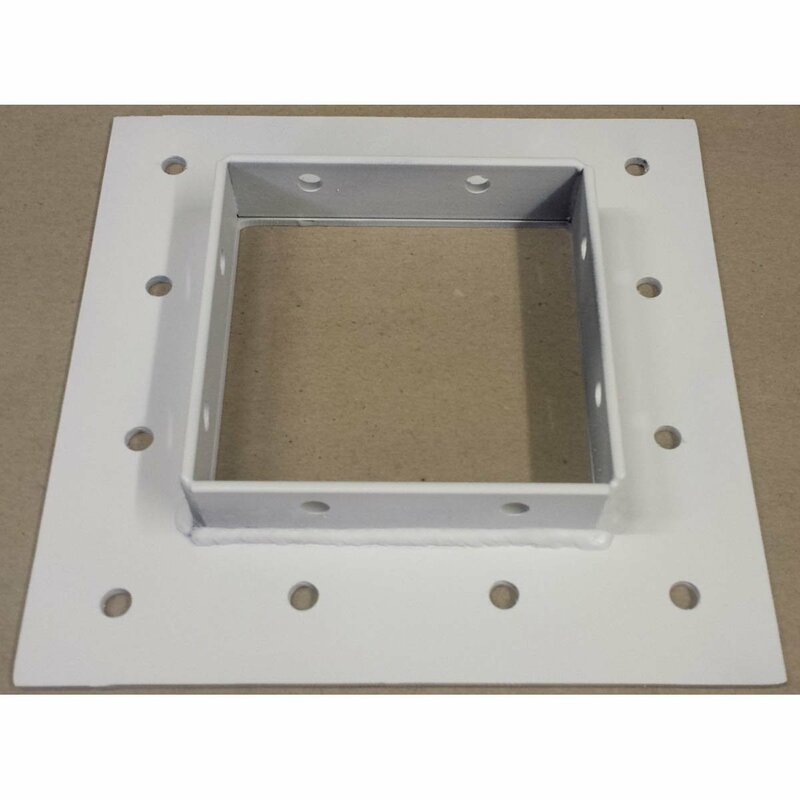 We can make your post cap connecting brackets left, right or center-oriented, so let us know which you prefer. 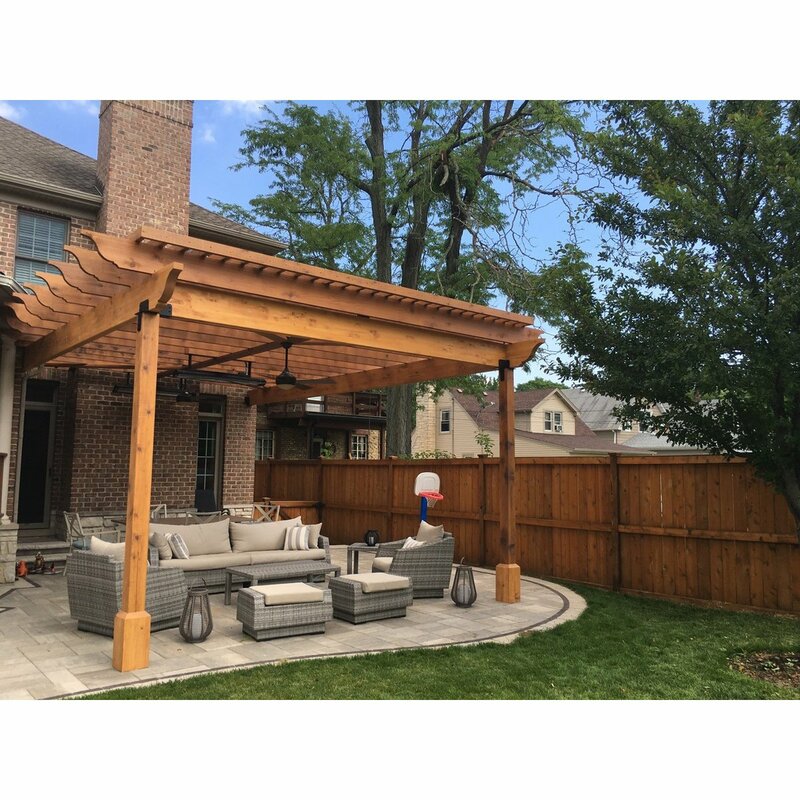 When you call us at (715) 718-0781 to place your order, specify the inside dimensions to fit your posts and beams perfectly. 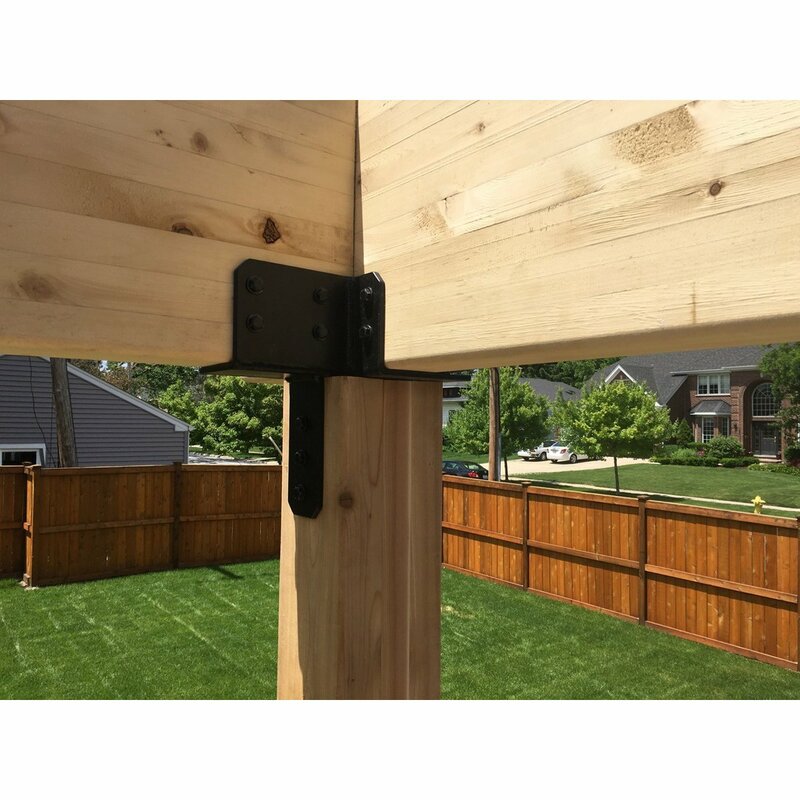 The purpose of custom post to column cross beam brackets is to connect four beams at the top of a column. 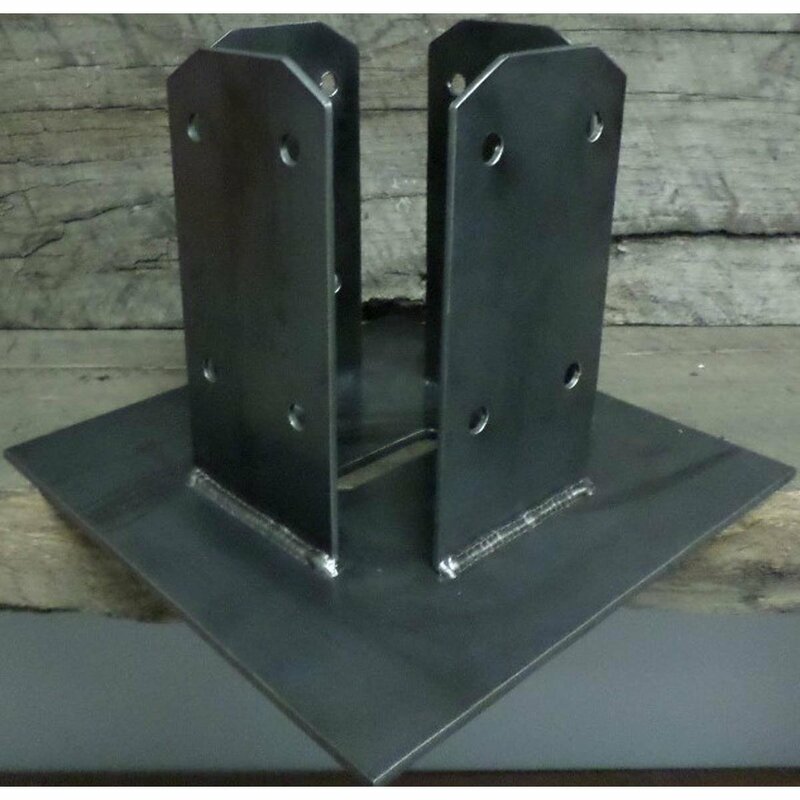 Our custom steel post to cross beam brackets are great for pergolas, gazebos, timber framing and other timber connections. 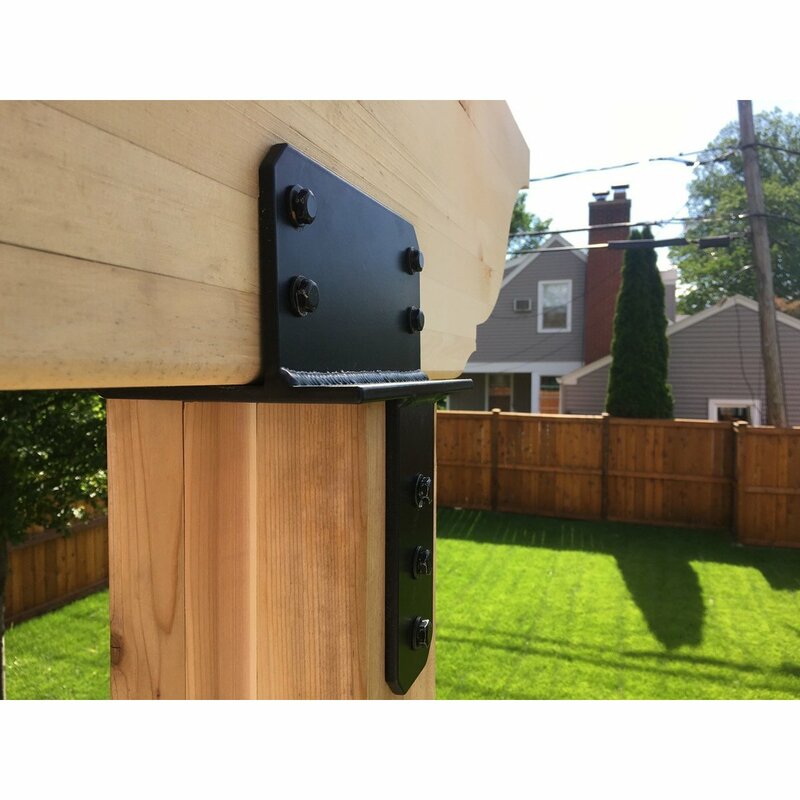 This particular bracket sits on top of a post and allows 4 beams to intersect at the top of that post. 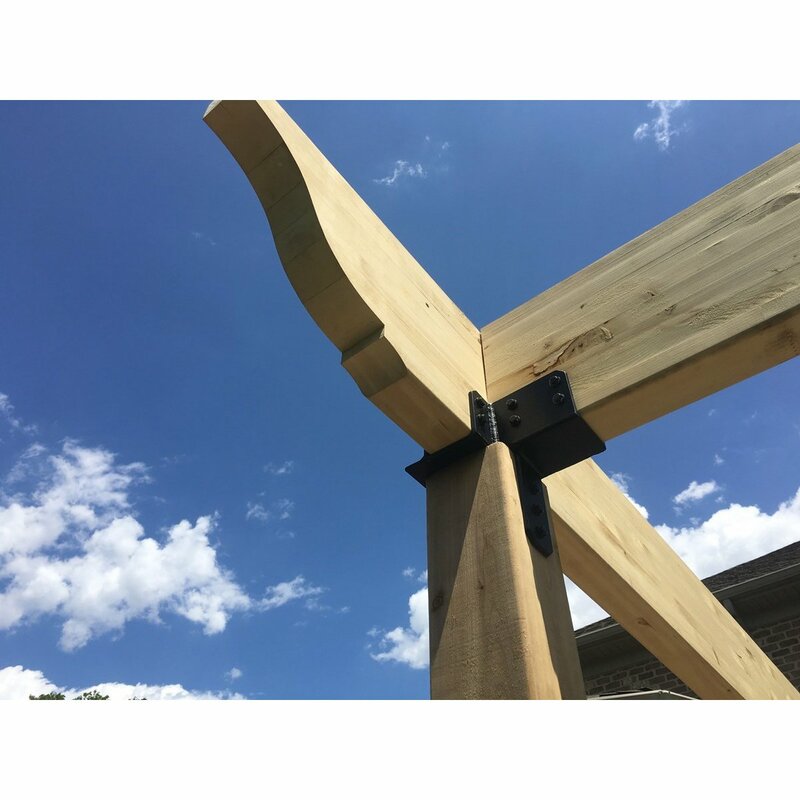 Straps or a sleeve can be made to run down the post, if that is your preference; and are made custom in thickness, size, shape, finish and design to fit your timber project perfectly. 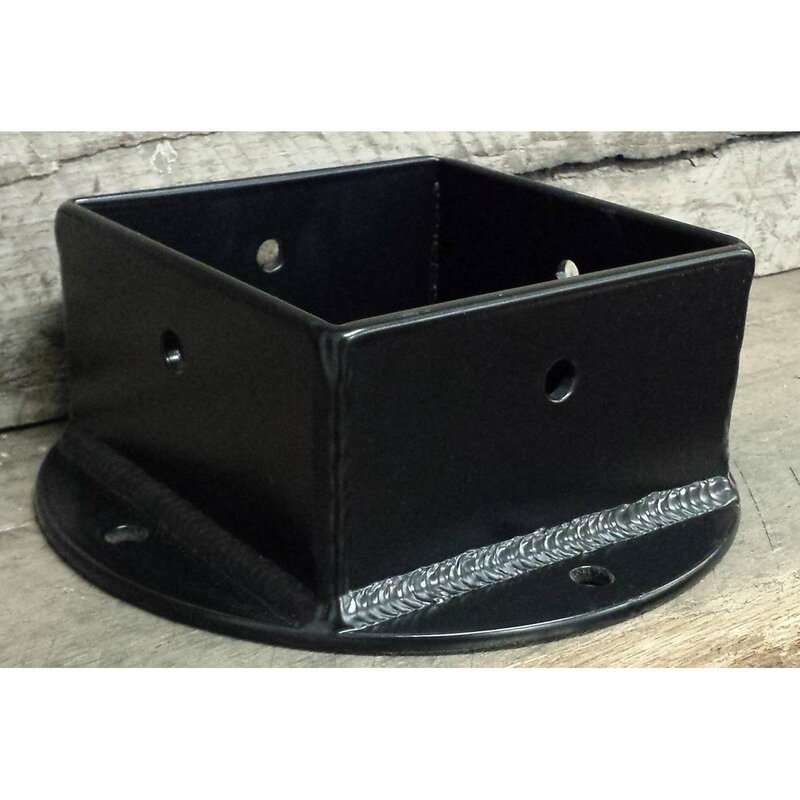 To order yours, give us a call at: (715) 718-0781. 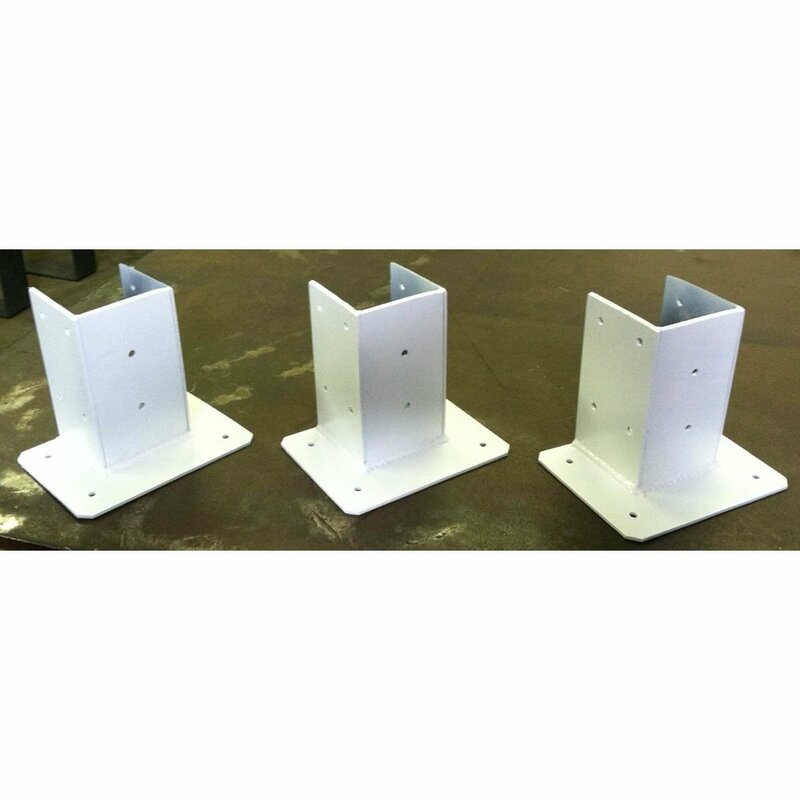 Here are examples of custom decorative post to girder beam supporting brackets. 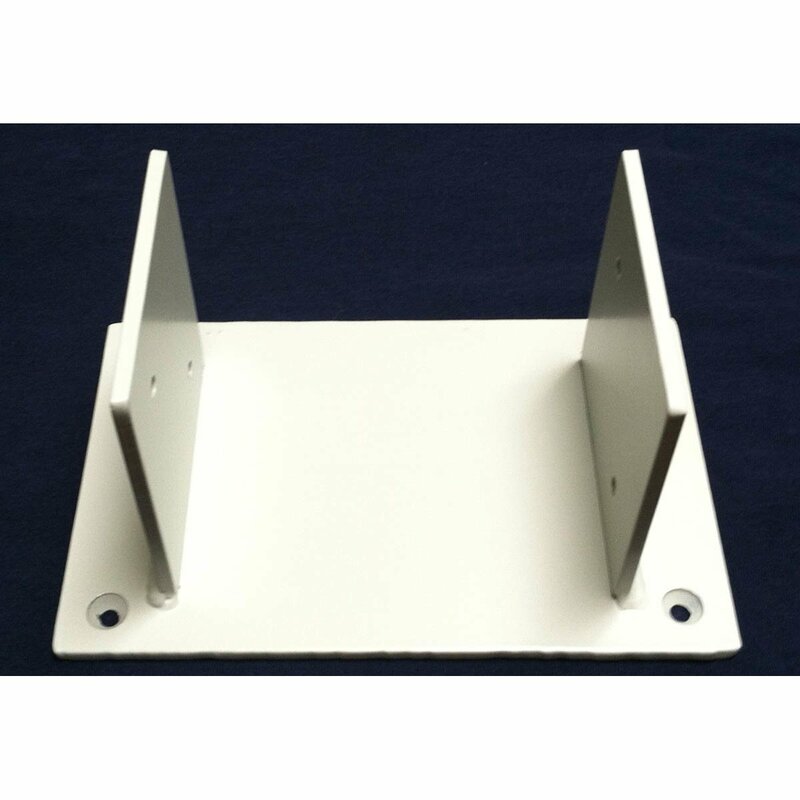 These supporting brackets are made to be mounted on the top of a post that holds a girder or beam that passes through or terminates over the post. 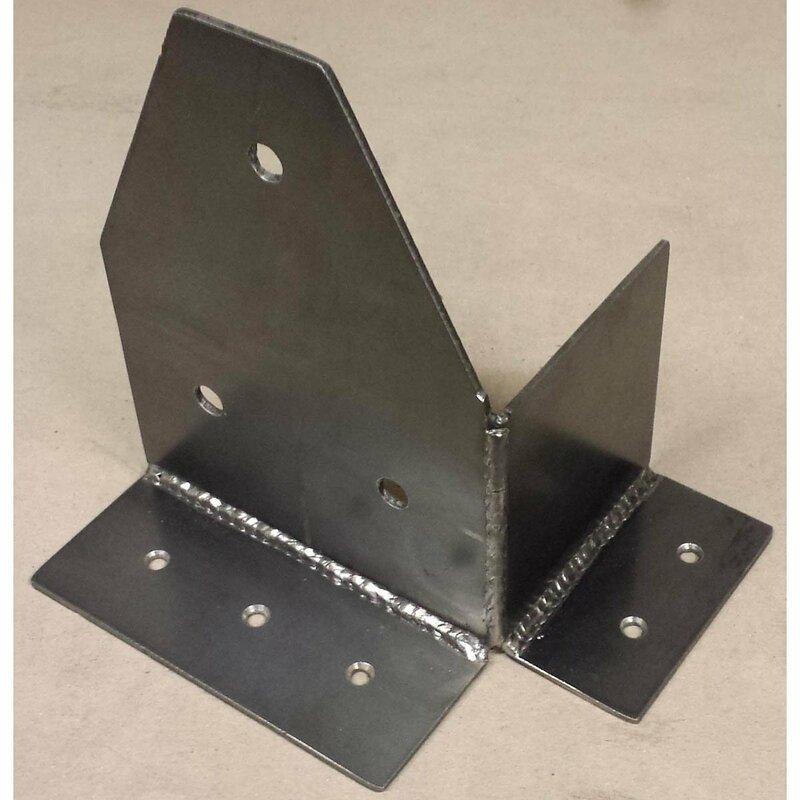 These are helpful when you need to marry a girder that is of a different thickness than the post it's connecting to. 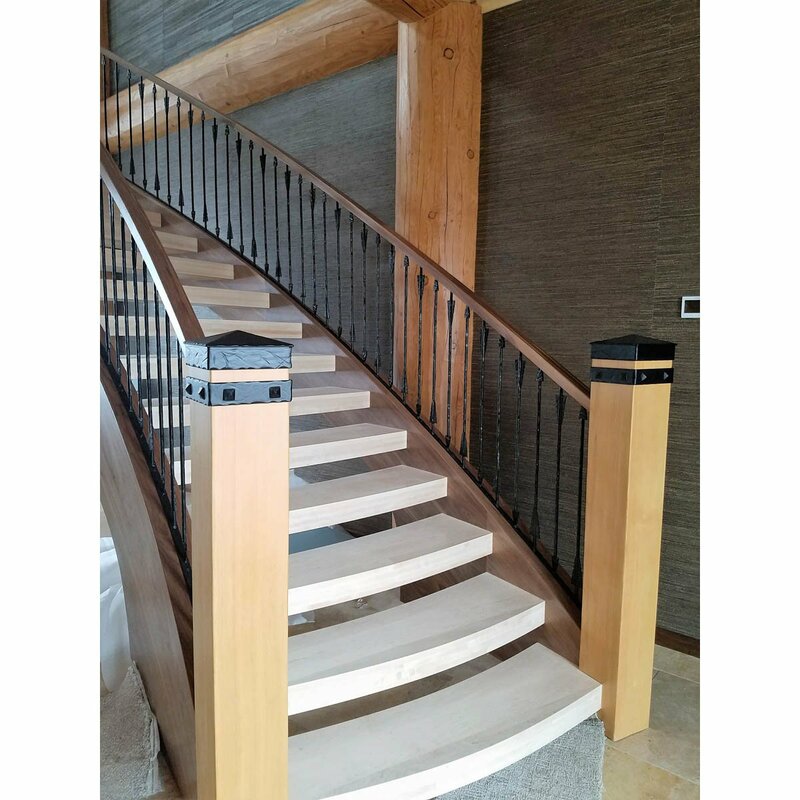 Because our products are completely custom to your needs; call us at: (715) 718-0781 to plan your next project around your custom design specifications. 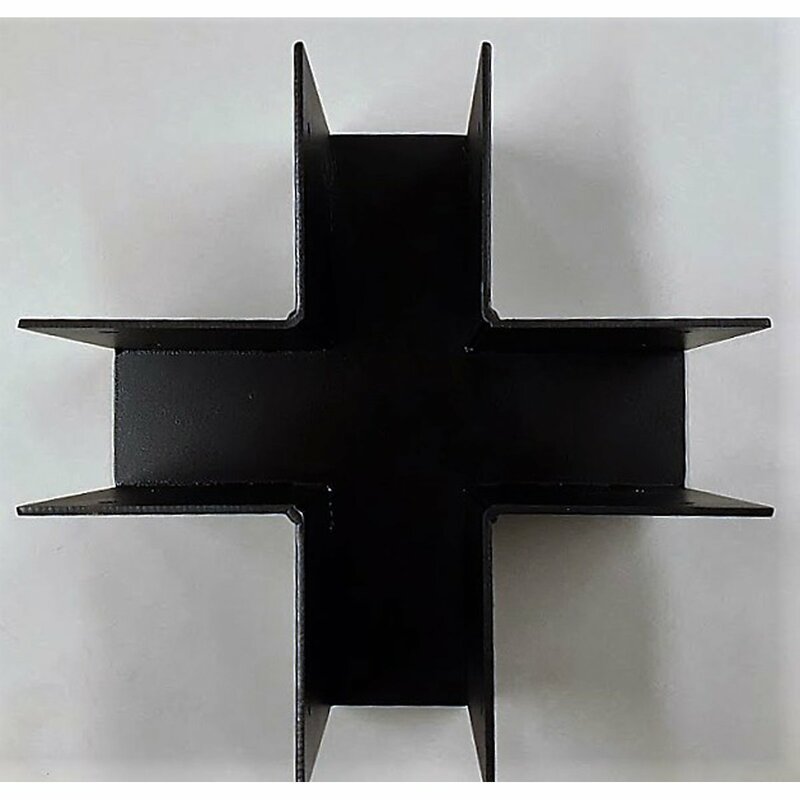 Standoff post to beam timber brackets are a really decorative way to mix wood and steel. 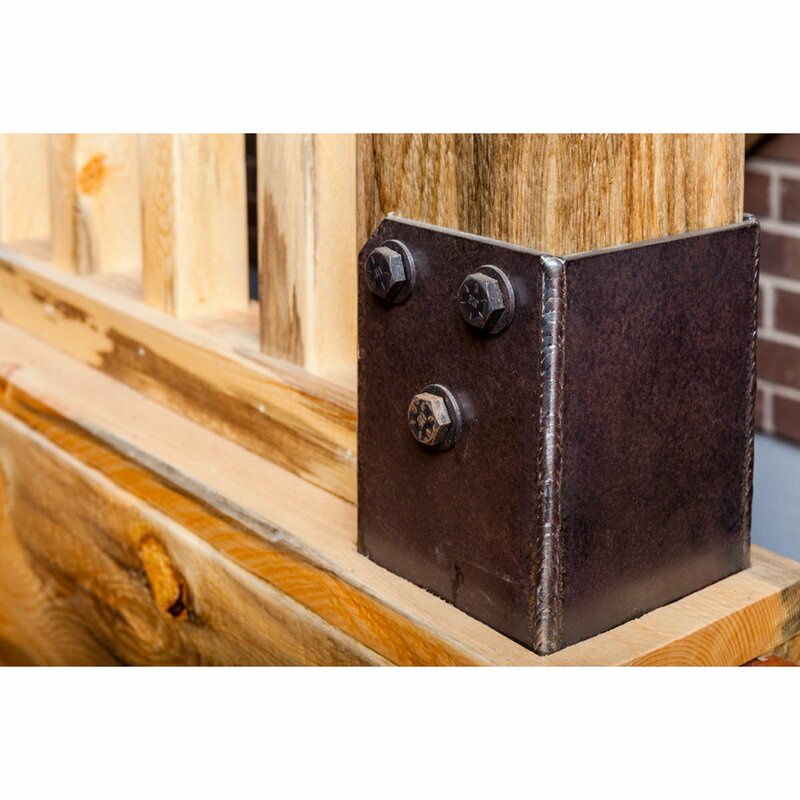 By putting a wooden beam on top of a post or a beam over another beam going the opposite direction; the beam will stand off a bit from the post giving the beam a bit of lift creating an interesting design. 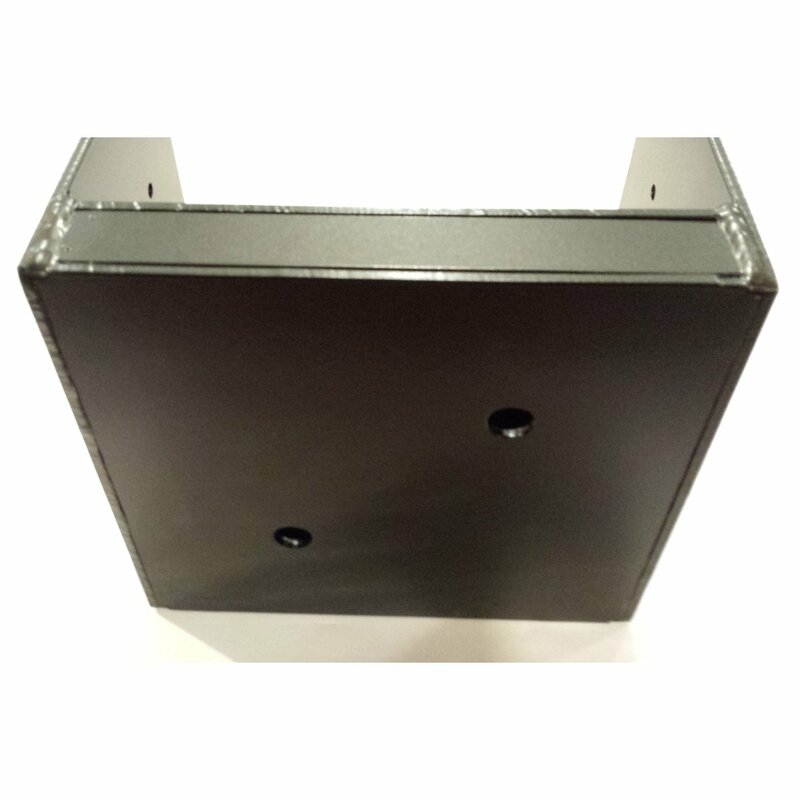 Your custom order starts by calling us at (715) 718-0781. 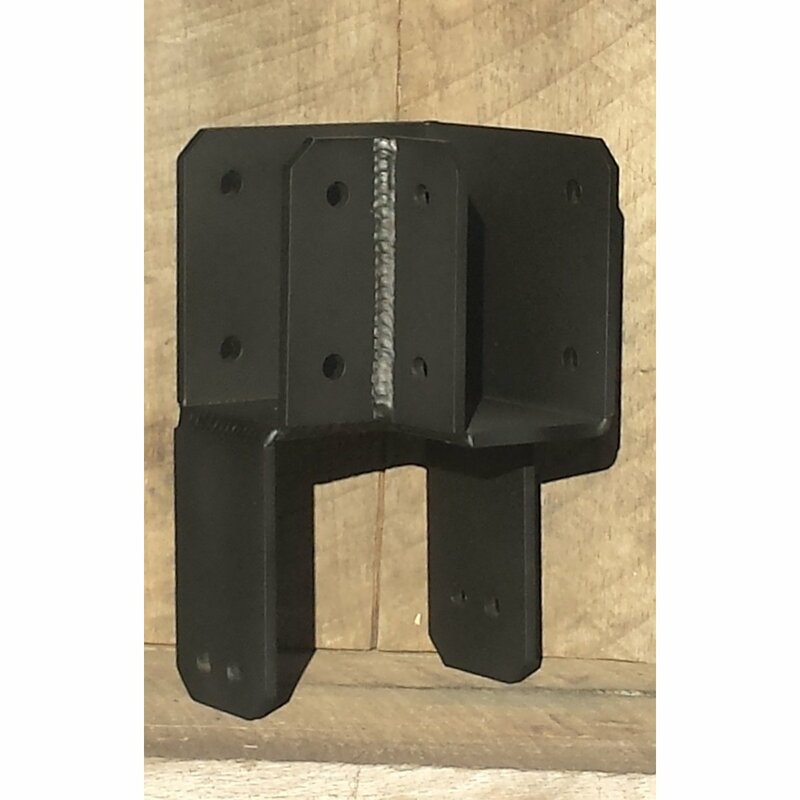 These decorative 4-sided timber post base brackets are made either for sliding a post through the bracket or for mounting the bracket to the floor in order to hold the post in place. 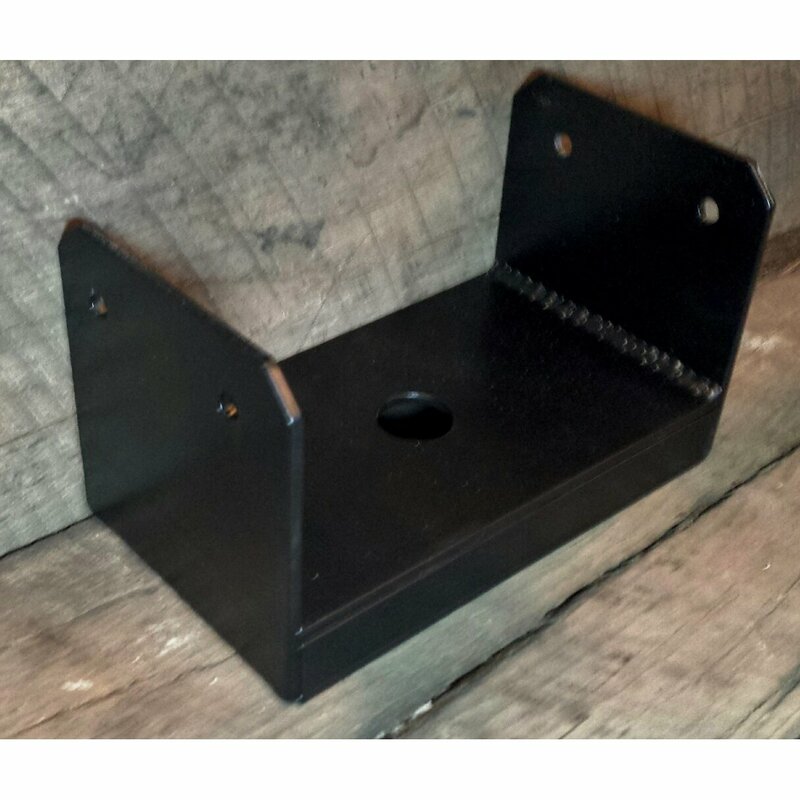 With the exact measurement of the post, we can custom make your wood post mounting brackets fit perfectly. 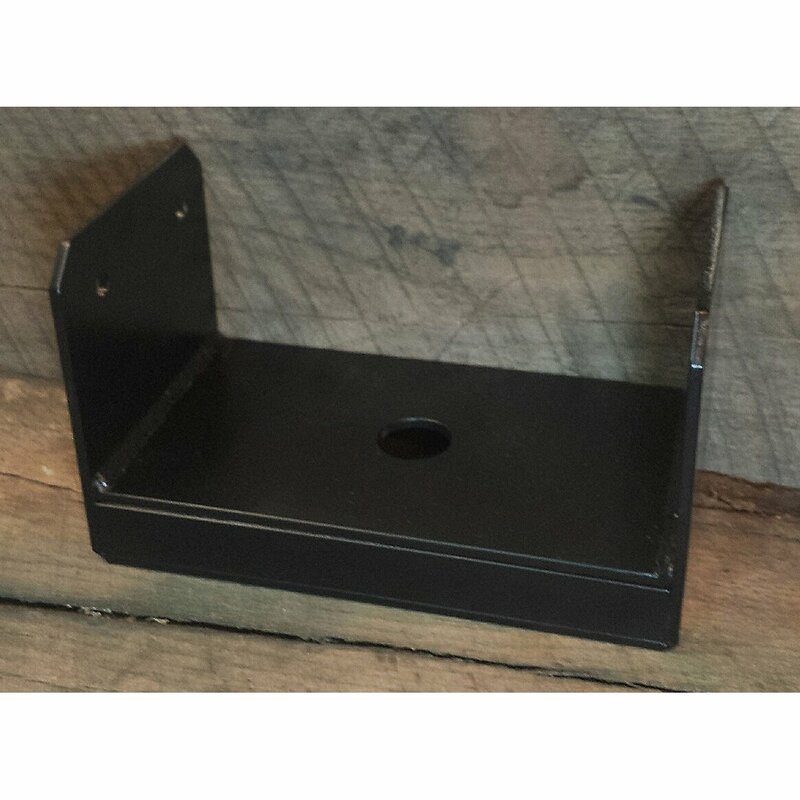 If you'd like to order some, give us a call at (715) 718-0781. 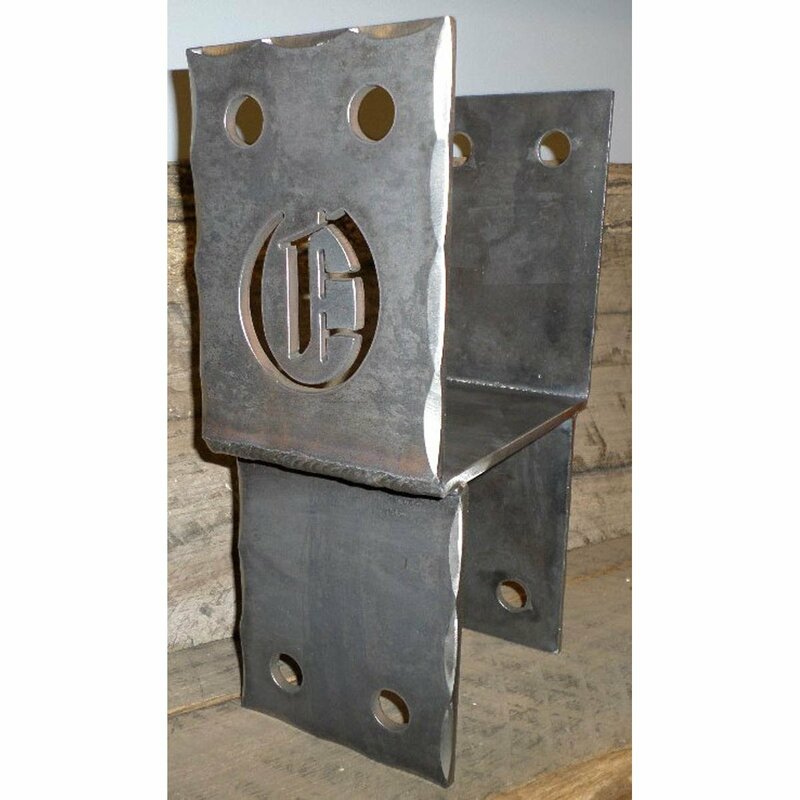 Steel 3-sided wood post base brackets are made to strengthen an existing post system. 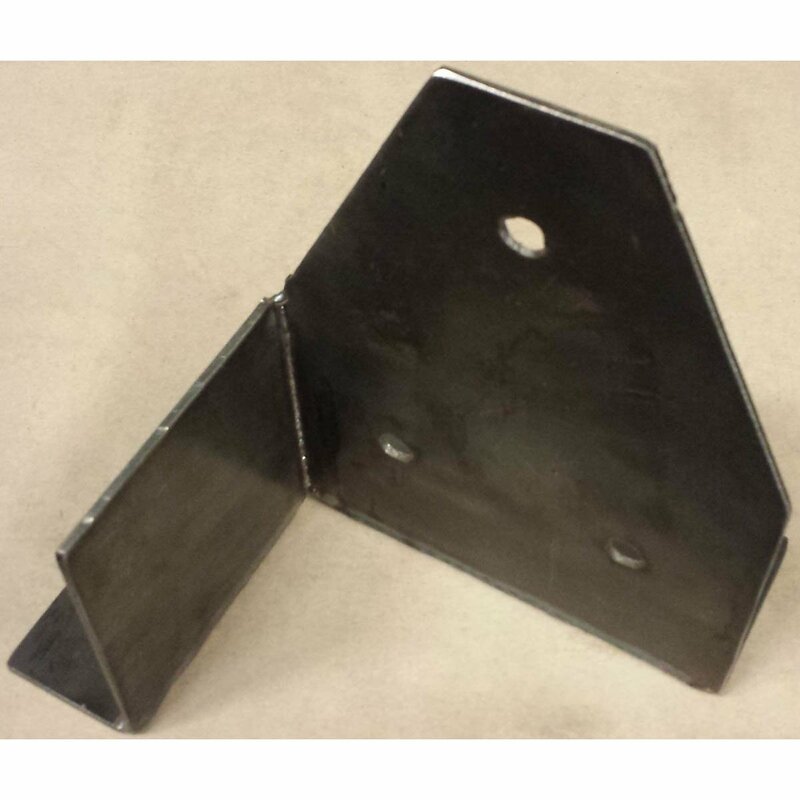 When slipped over existing posts and mounted to the floor, these post anchors add sturdiness to railings. 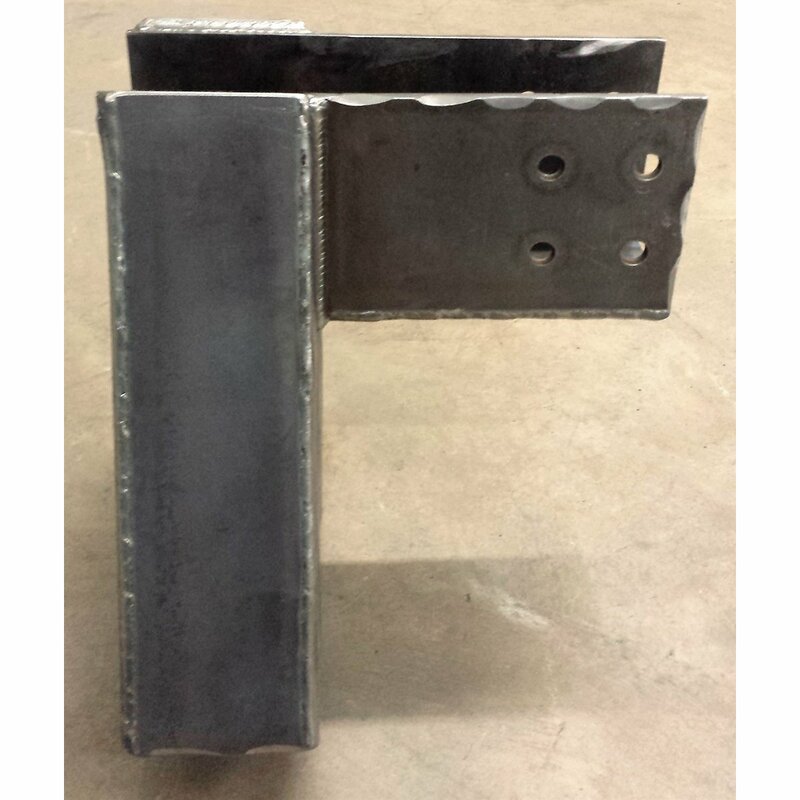 Because we offer completely custom metal brackets, you can design yours to fit any custom-building project. 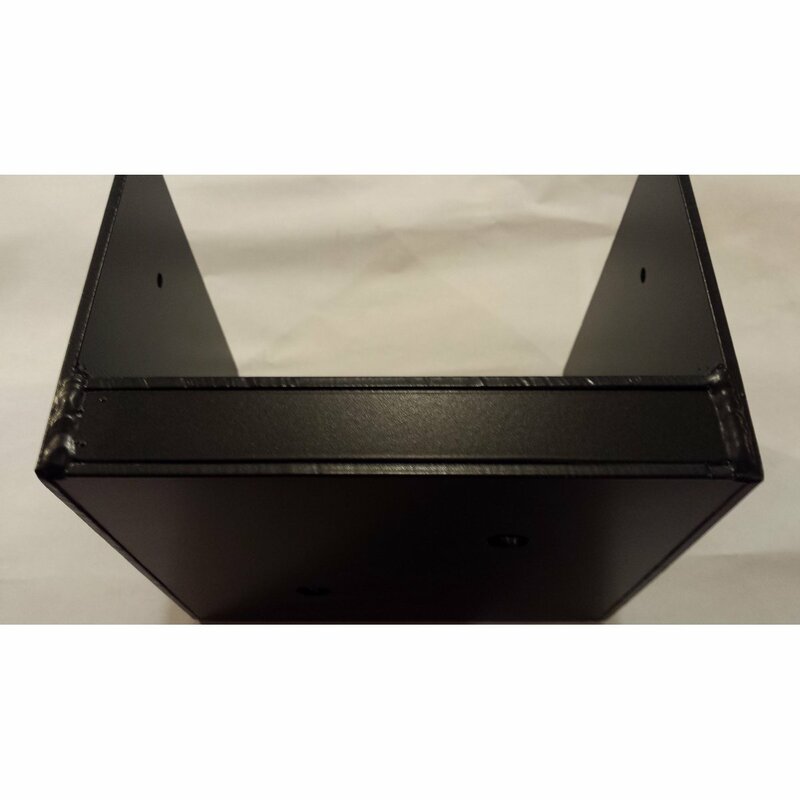 If you'd like to order some, give us a call at (715) 718-0781. 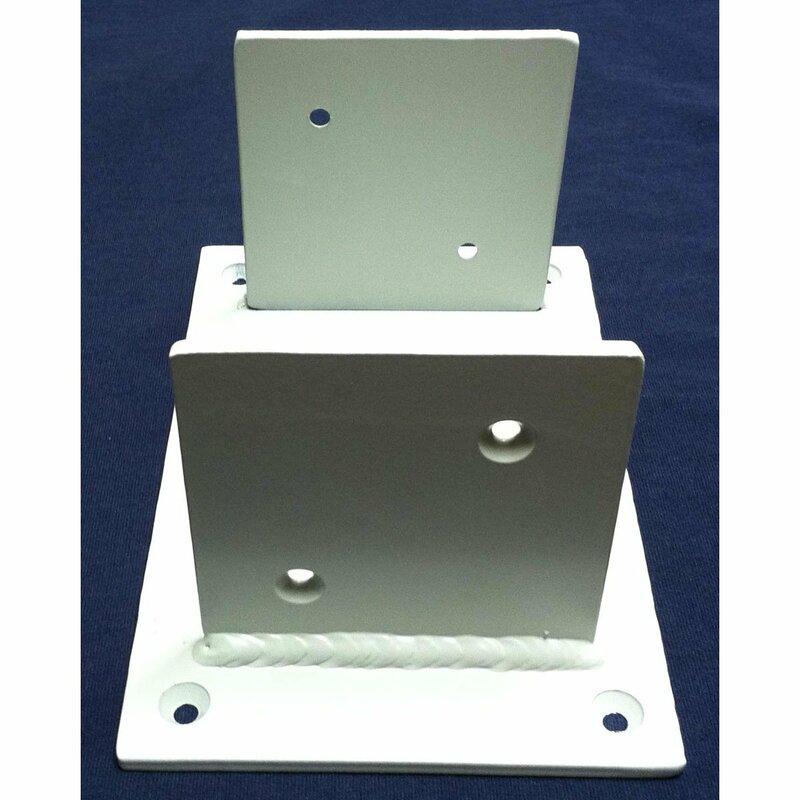 These 2-sided wood post base brackets are very easy to install and look great with new posts. 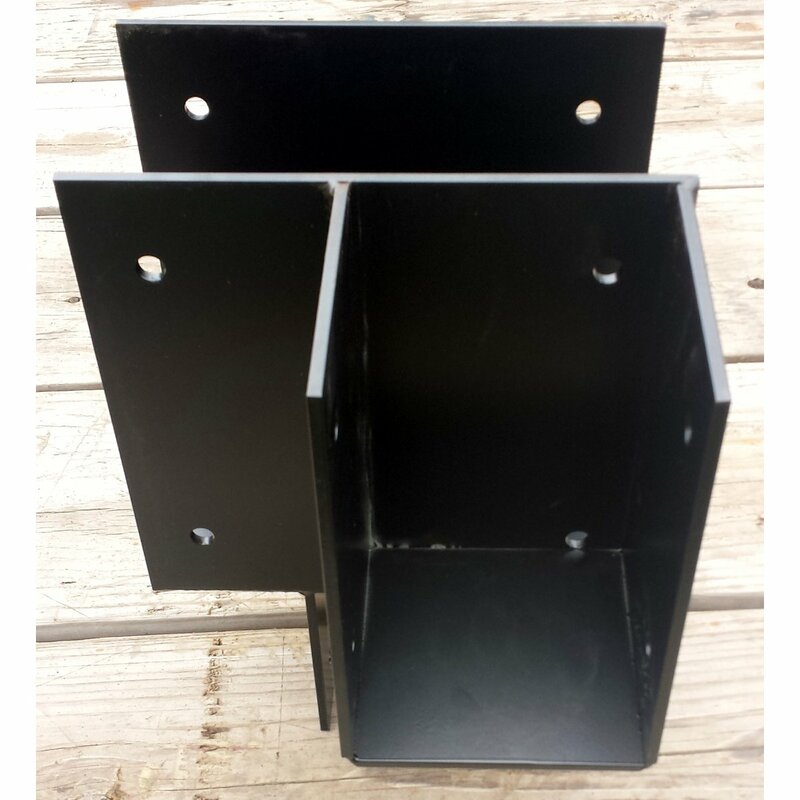 The post can be fastened inside these custom brackets and then secured to the floor for stability. 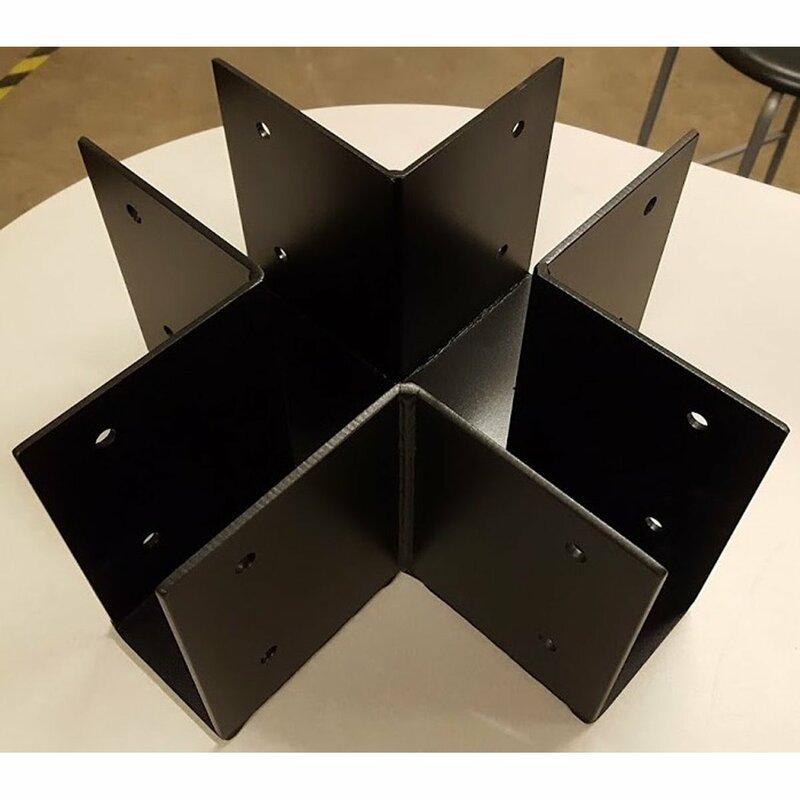 The flange can either be on the outside or on the inside if you prefer to hide them. 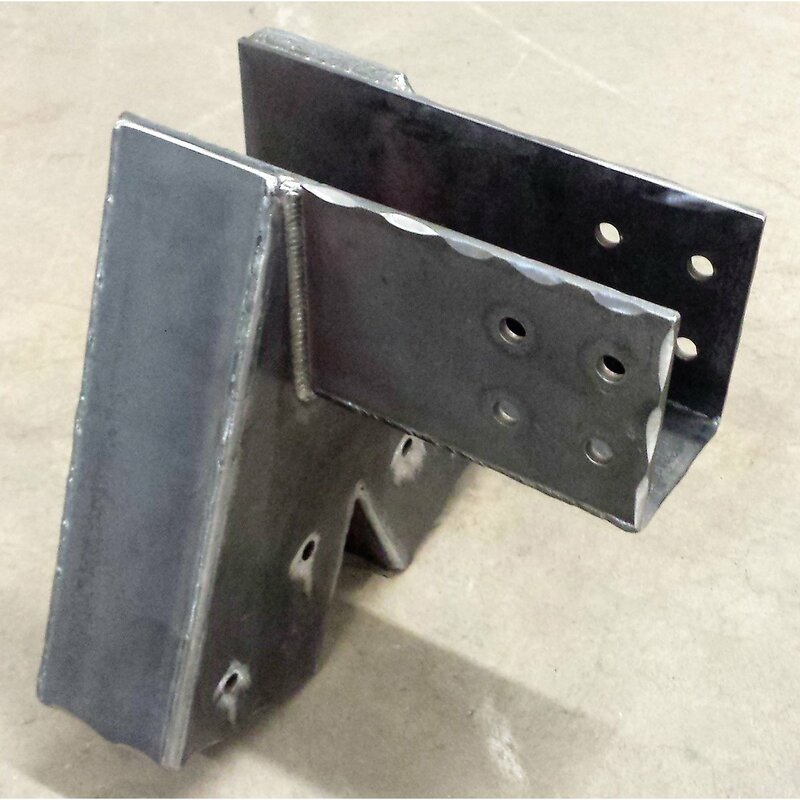 We make any size/shape of brackets, so get a hold of us to discuss your project. To order yours, call (715) 718-0781. 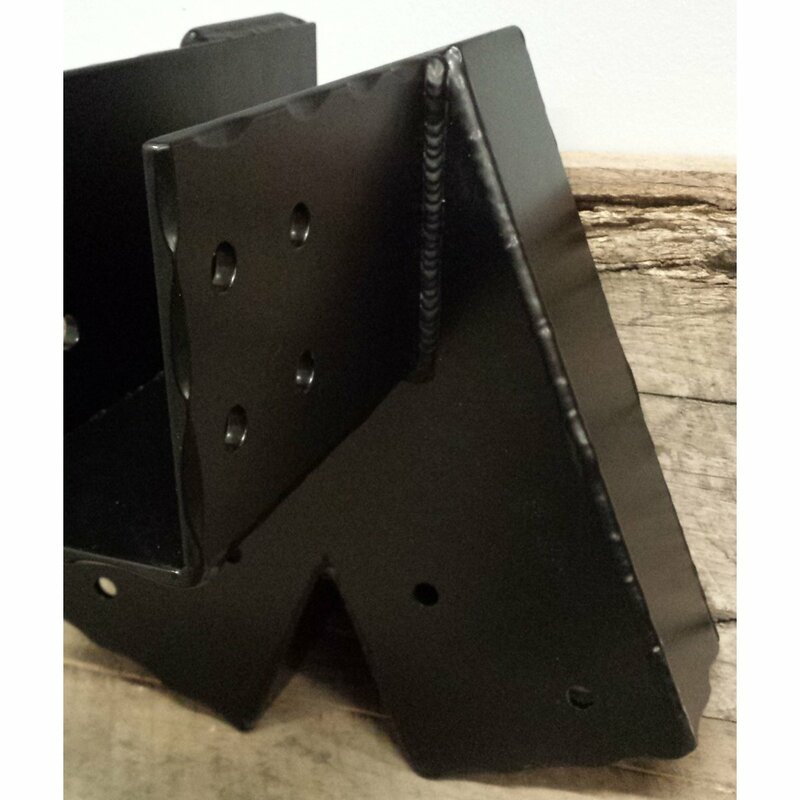 These two sided decorative post brackets are so simple to install and they dress up the base of your posts, giving them that rustic, industrial look. 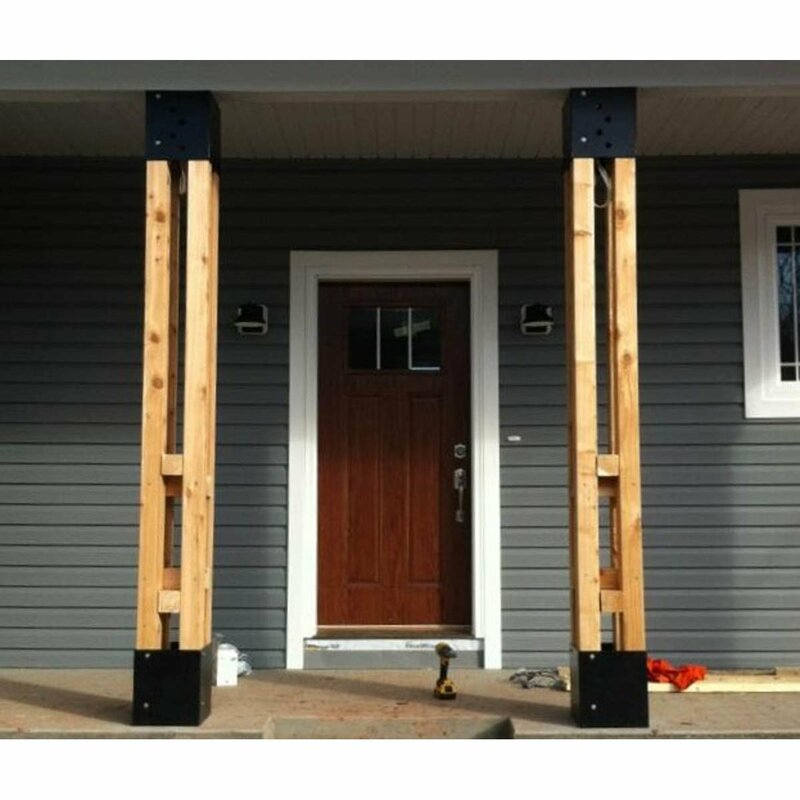 Adding these is as simple as placing at the base of the post and bolting into the flooring and post. 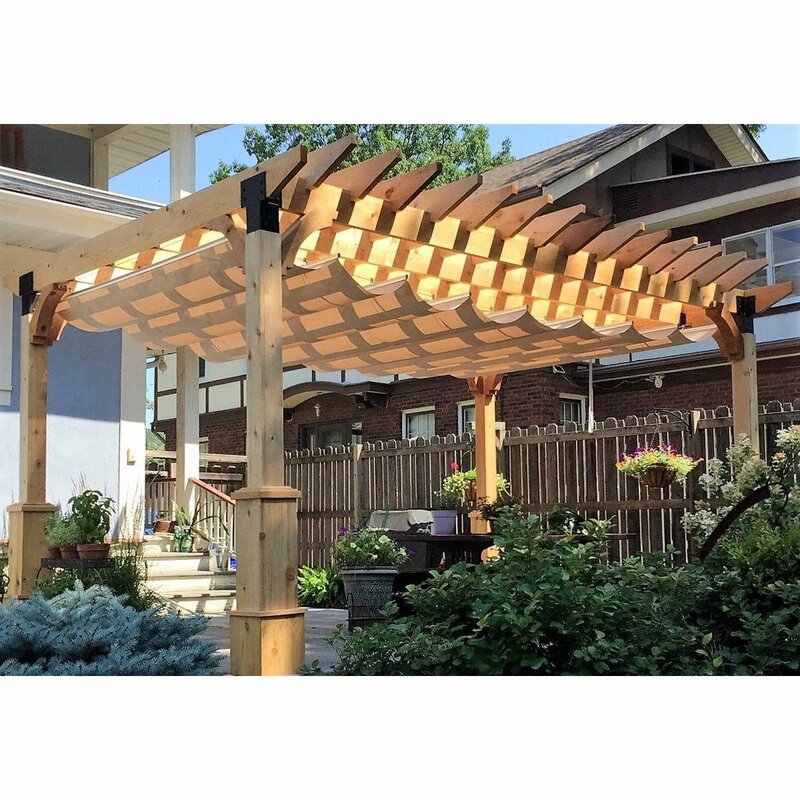 These will add value to your home and look great for years. 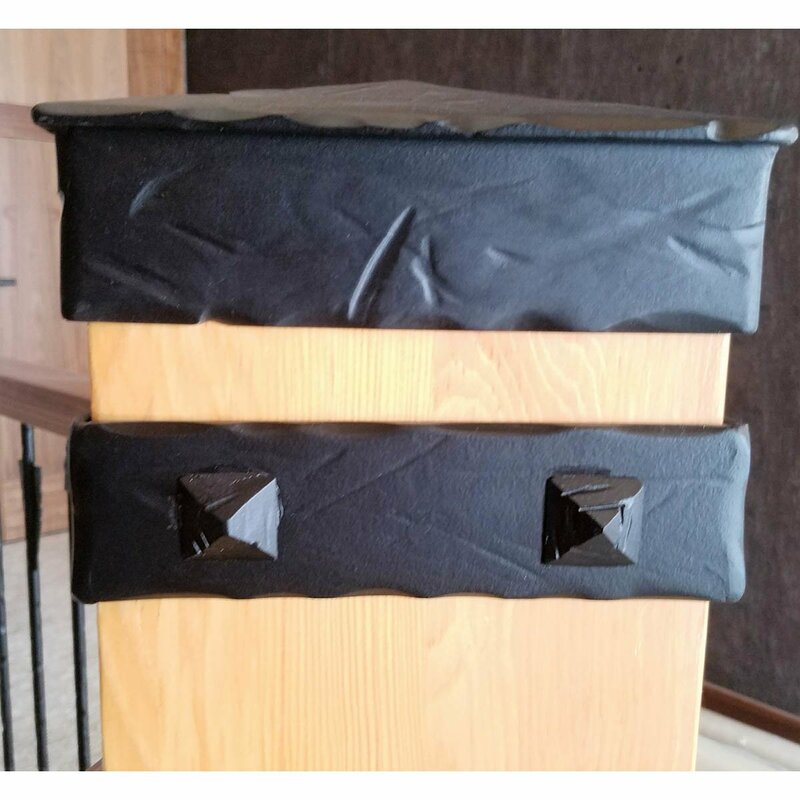 Not only decorative, these will hold your posts in place as intended. 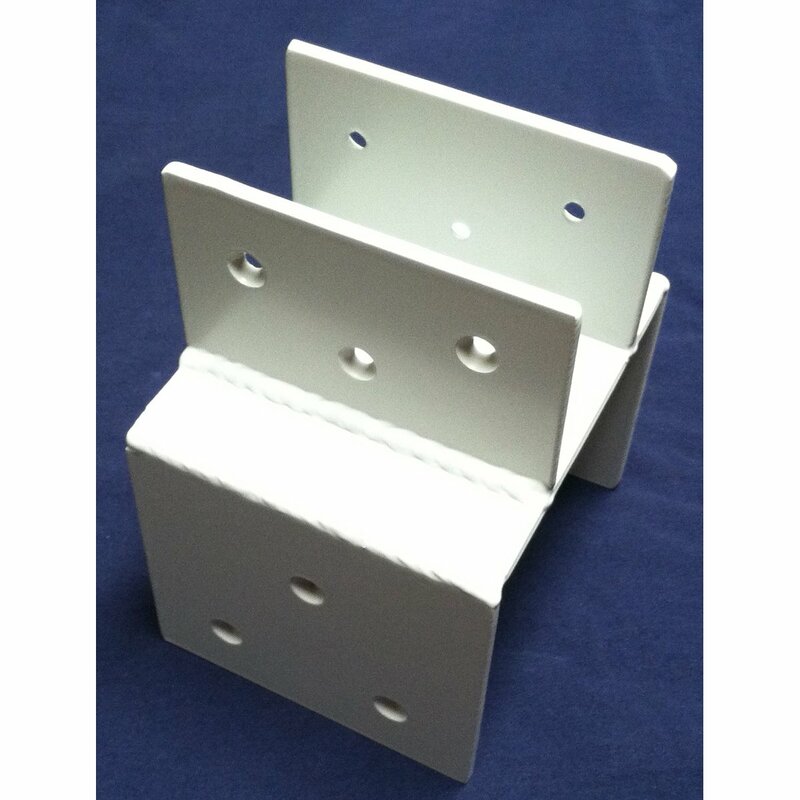 Different thicknesses and sizes are our specialty. 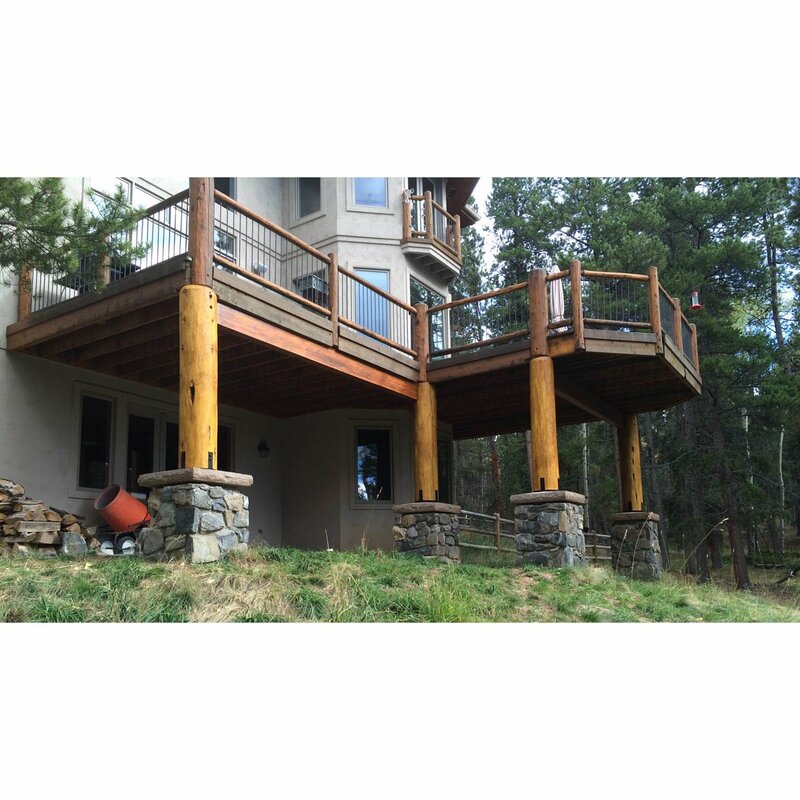 Just give us a call to discuss your project. If you'd like to order some, give us a call at (715) 718-0781. 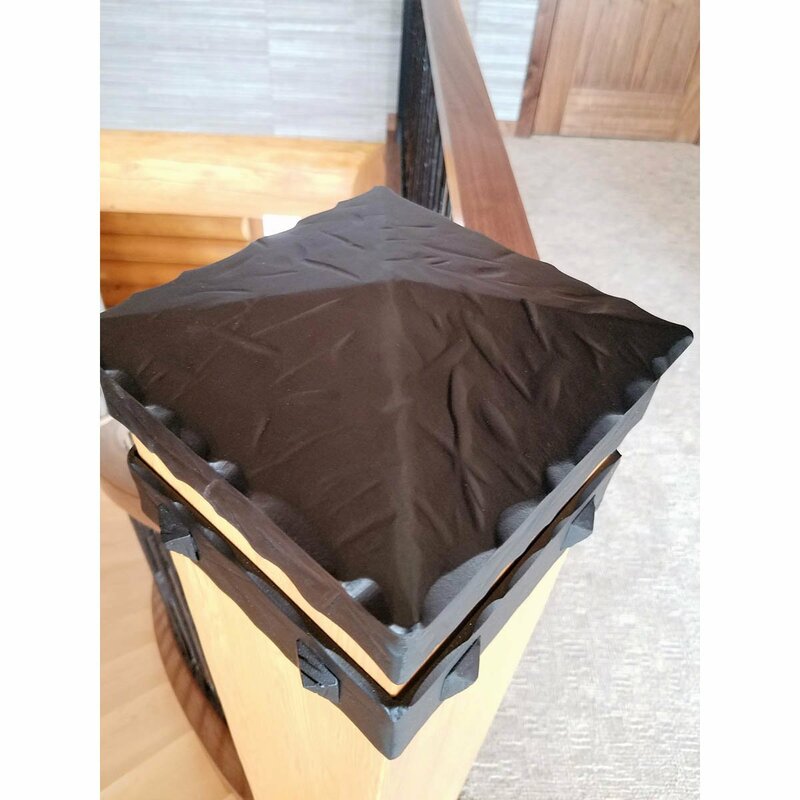 Uplift post base brackets keep wooden posts off the ground or floor where water damage can occur. 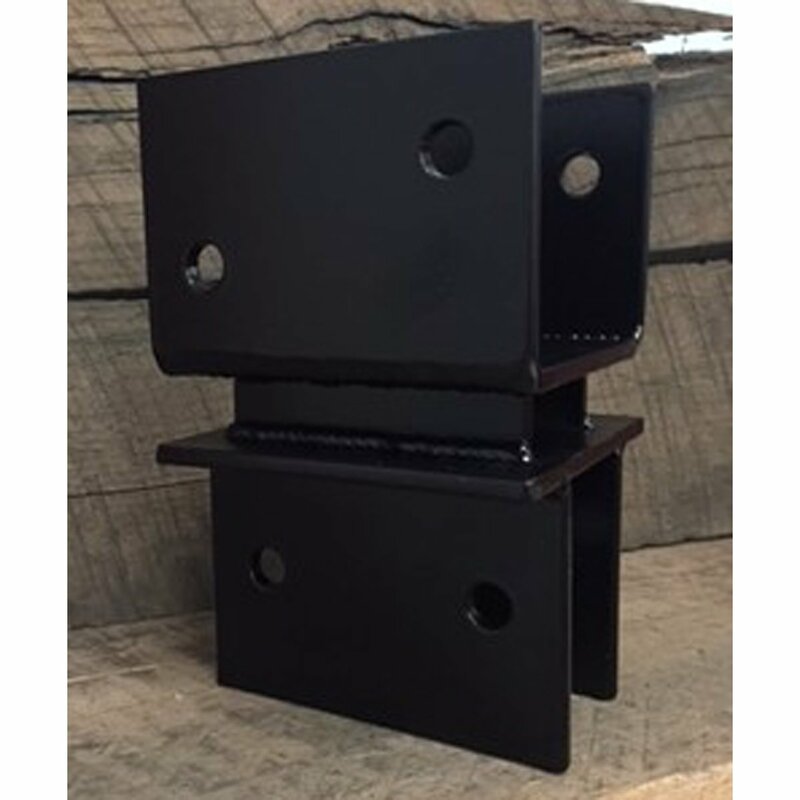 To order these brackets: first, measure the dimensions of your posts; then decide the quantity, thickness, hole size, and finish and we will custom make them to your specifications. To order yours, call: (715) 718-0781. 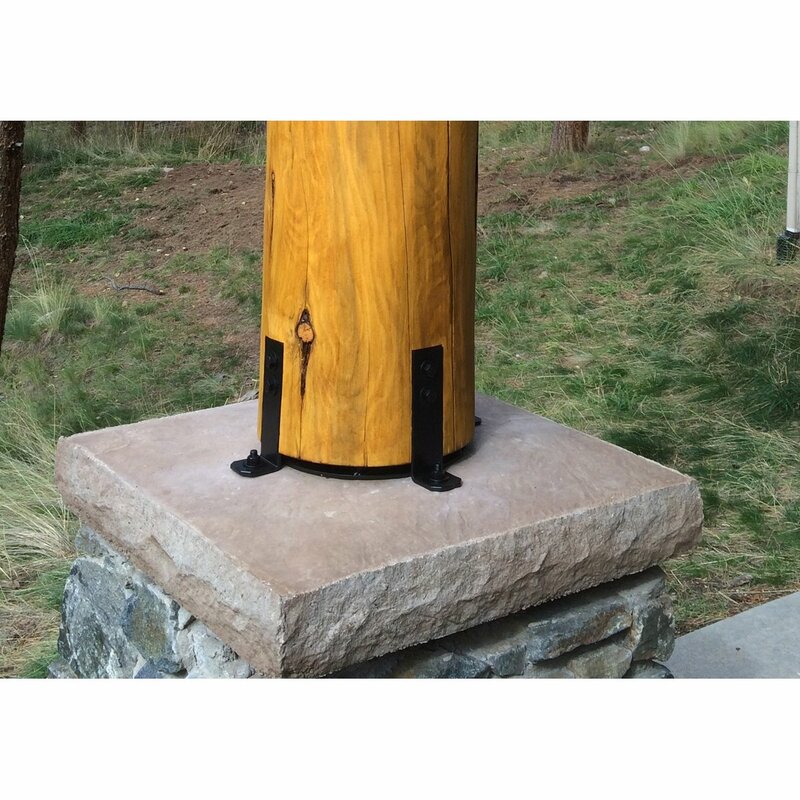 Round base uplift post brackets lift round log posts off of the ground to keep them dry. 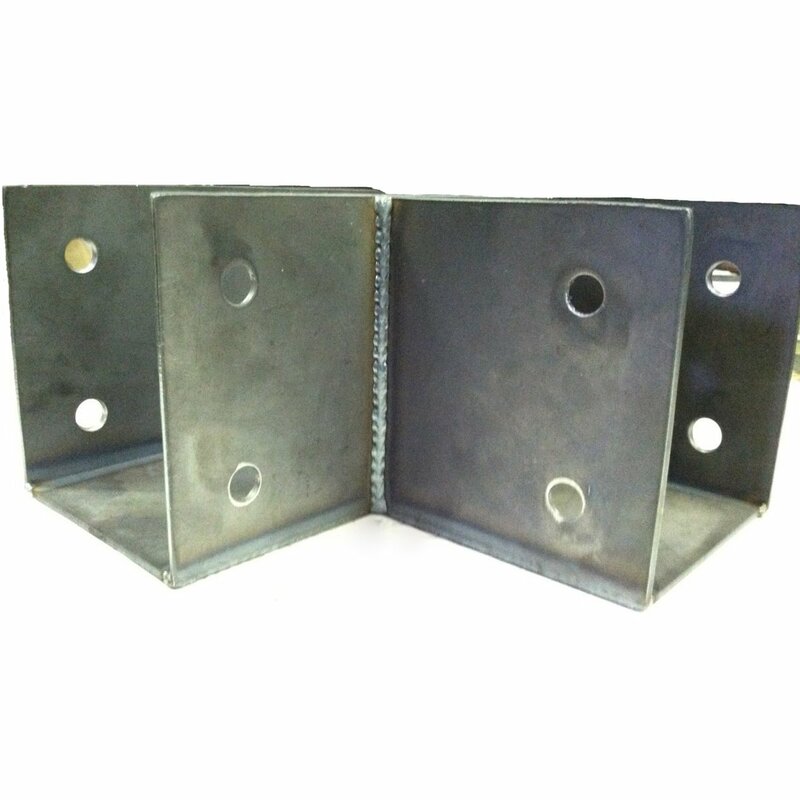 Our steel footings for posts have holes in them to mount to concrete and an access hole for tightening the concrete anchor or, if you wish, these steel brackets can be mounted only to the post and then sit directly on concrete. 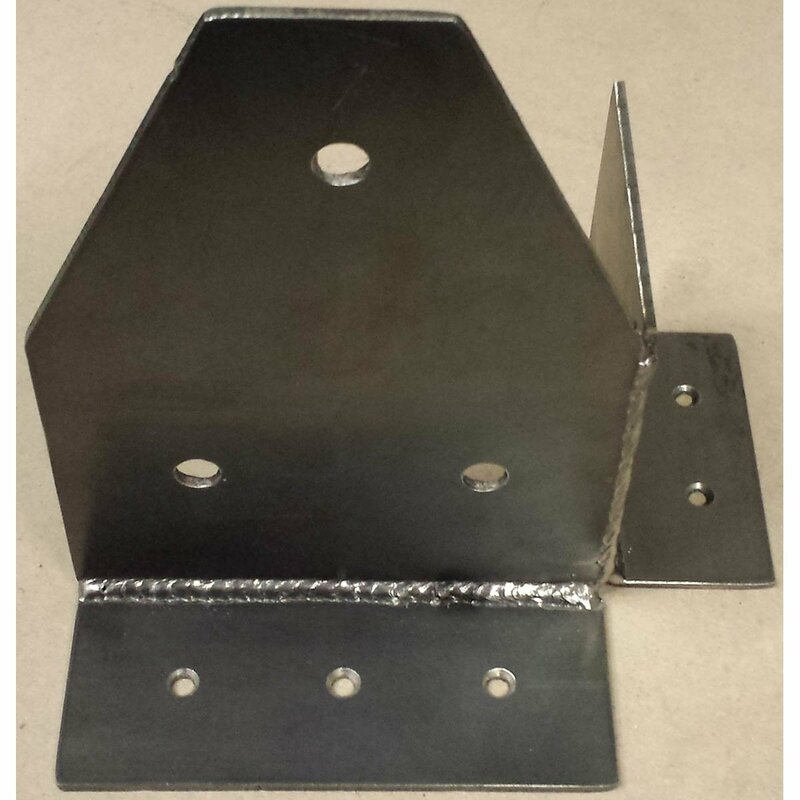 Another option is to have us weld straps on the sides so that you can secure both the bracket to the cement and also the post to the bracket. 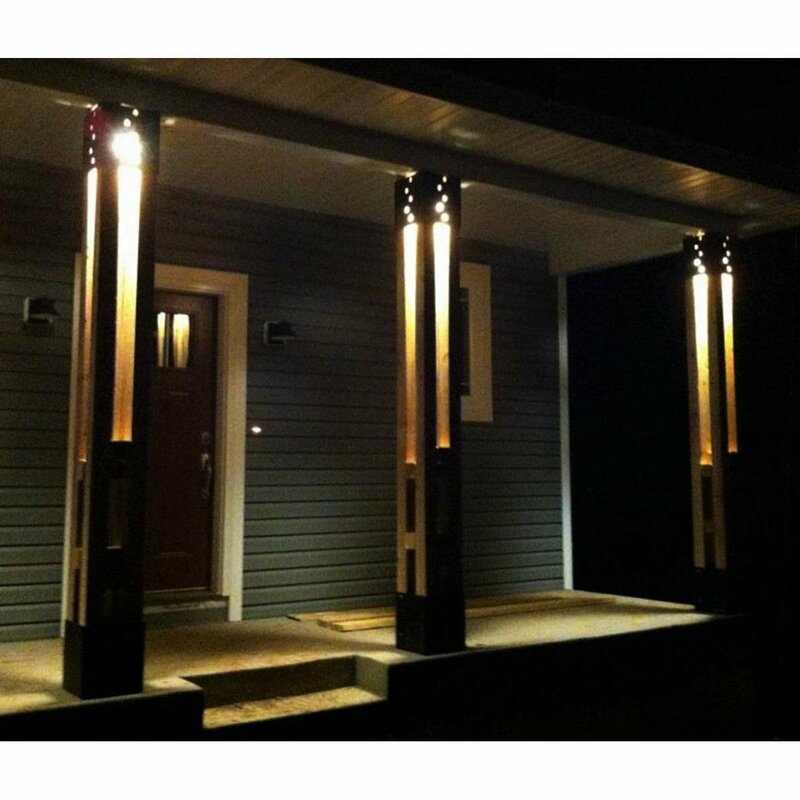 Help with your next project is just around the corner when you call us at: (715) 718-0781. 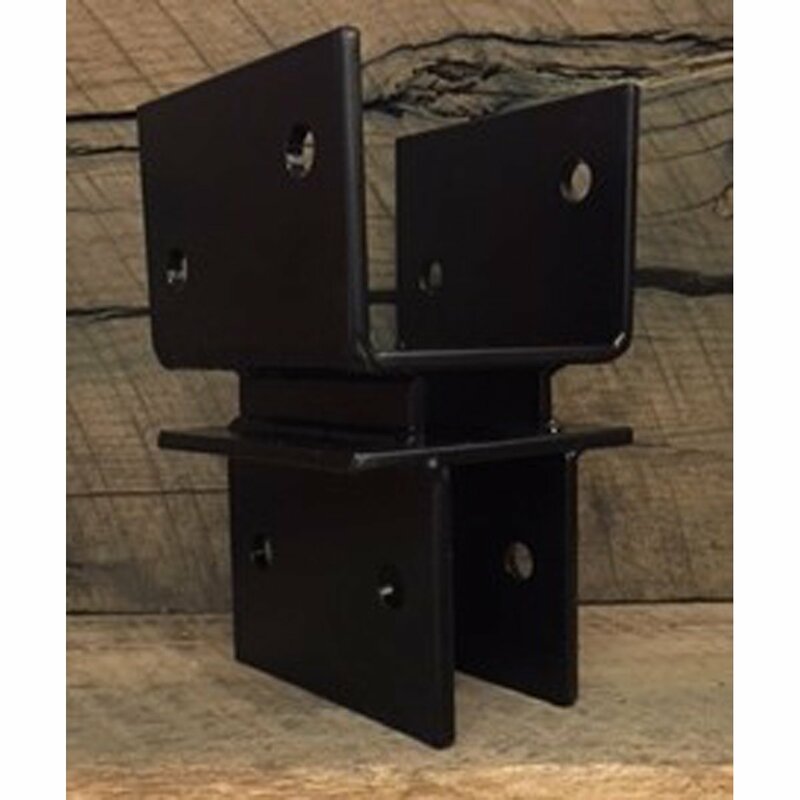 Our face mount railing post brackets are 4-sided and are great for mounting a railing to the outer perimeter of the decking of a balcony or deck in order to maximize the square footage of your living space. Custom order these for any sized post and request whatever finish suits your design. To order yours, call: (715) 718-0781. 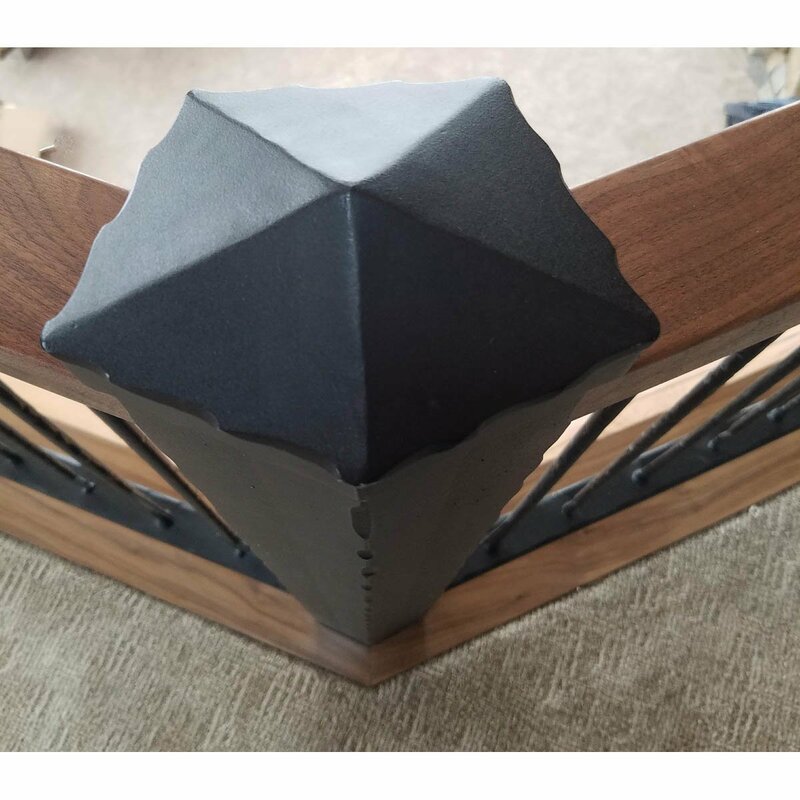 Our high-end steel decorative post caps and bands really dress up wood railing posts. 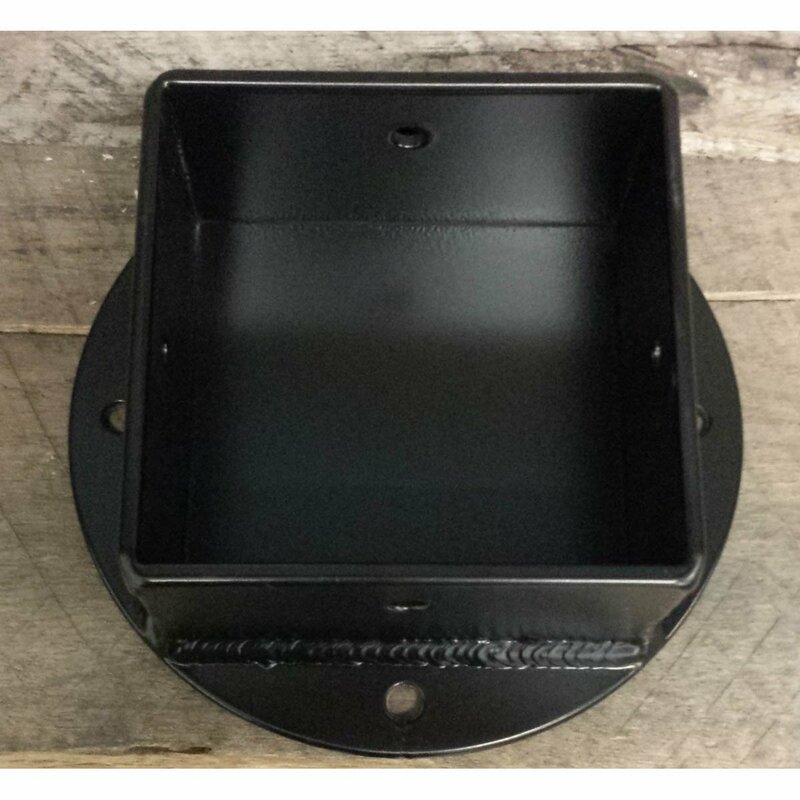 This particular sample is very rustic; hammered, weathered, and randomly peened with a hunting theme adds to the completed design that our customer wanted for their lodge. Matching weathered handmade clavos and straps tie everything together and they can be ordered from us. 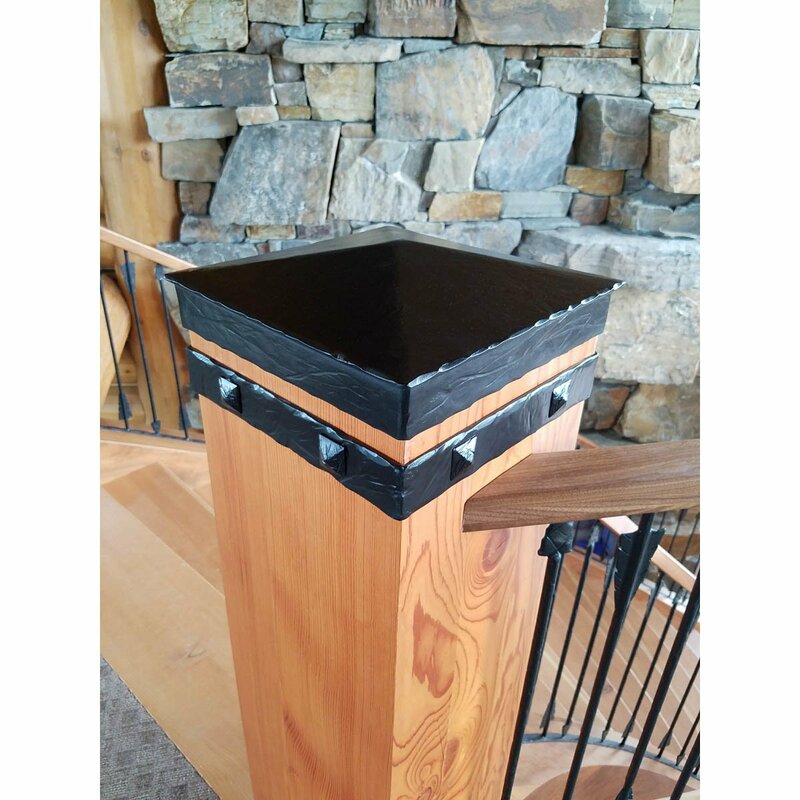 These post caps and bands are a superb way to dress up posts for a lodge, timber frame home, cabin, or rustic home or business. 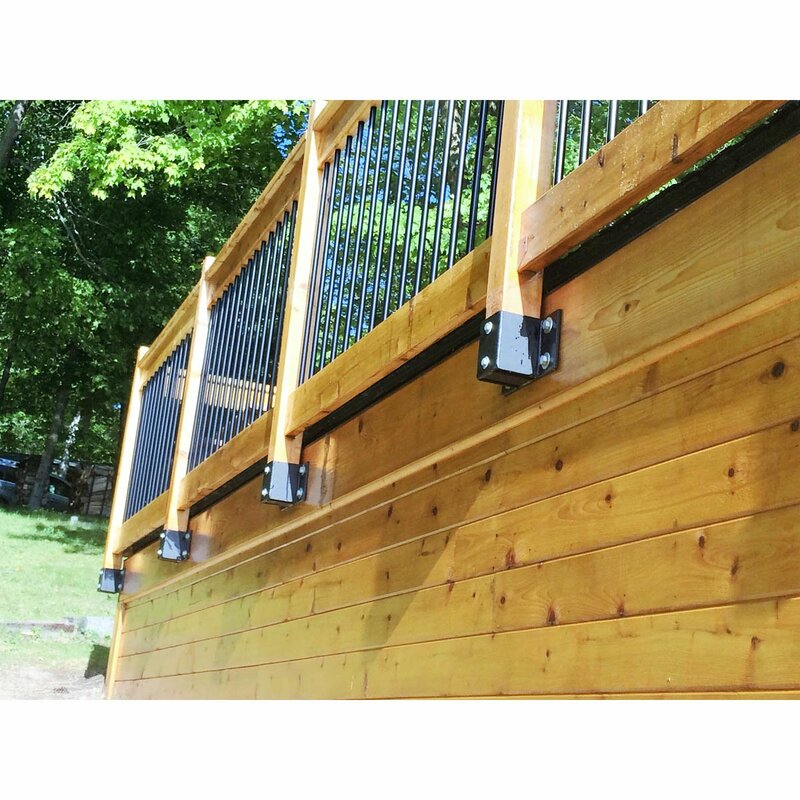 If you'd like to order a set to complete your railing project; call us at (715) 718-0781. 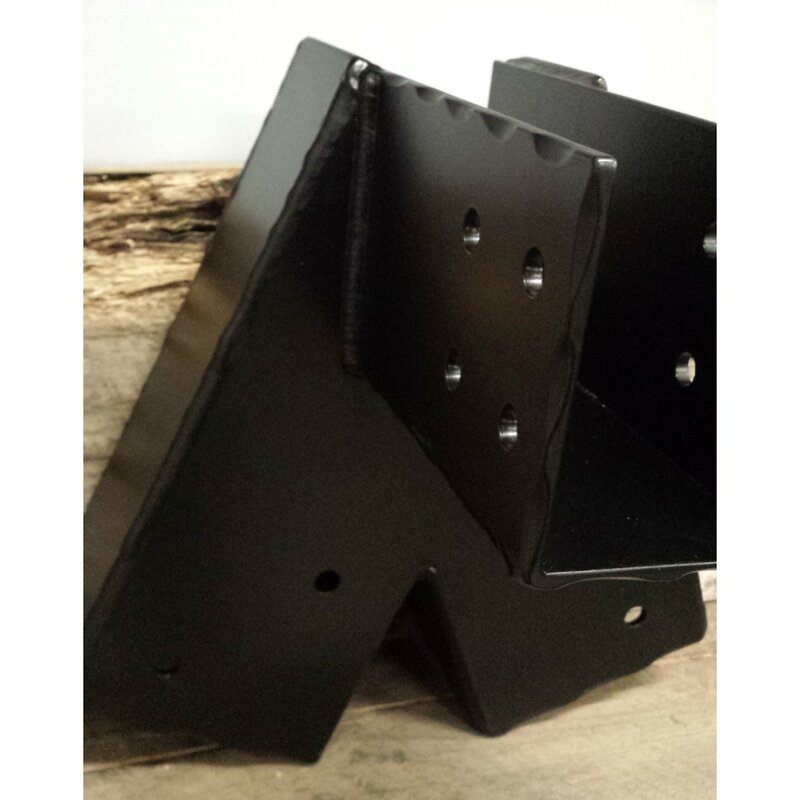 Custom made steel swing set brackets for timbers make putting together a swing set that much easier. 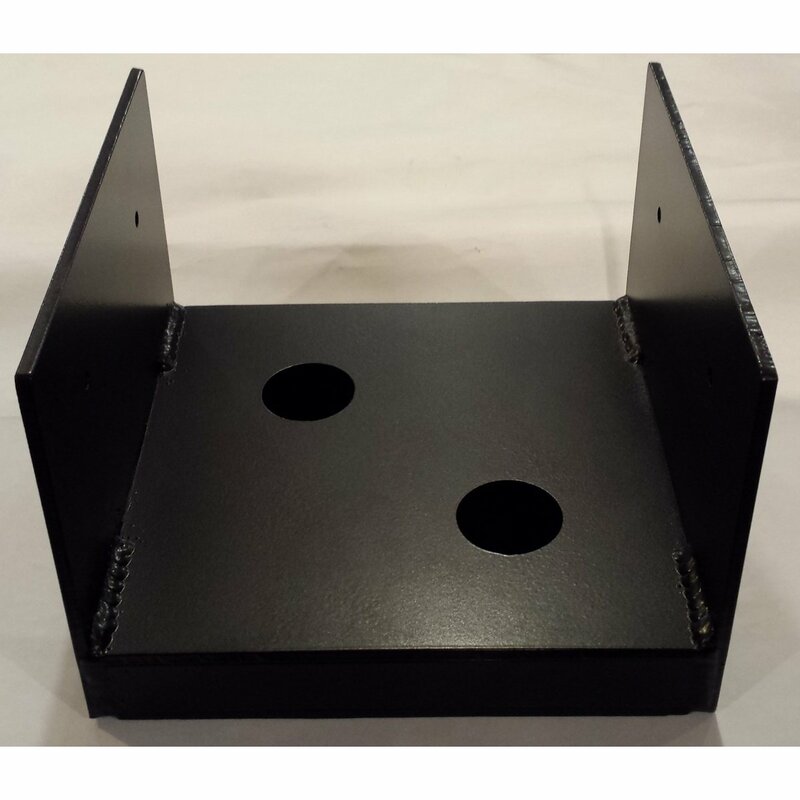 We custom make these any size, finish, thickness to suit your swing set. 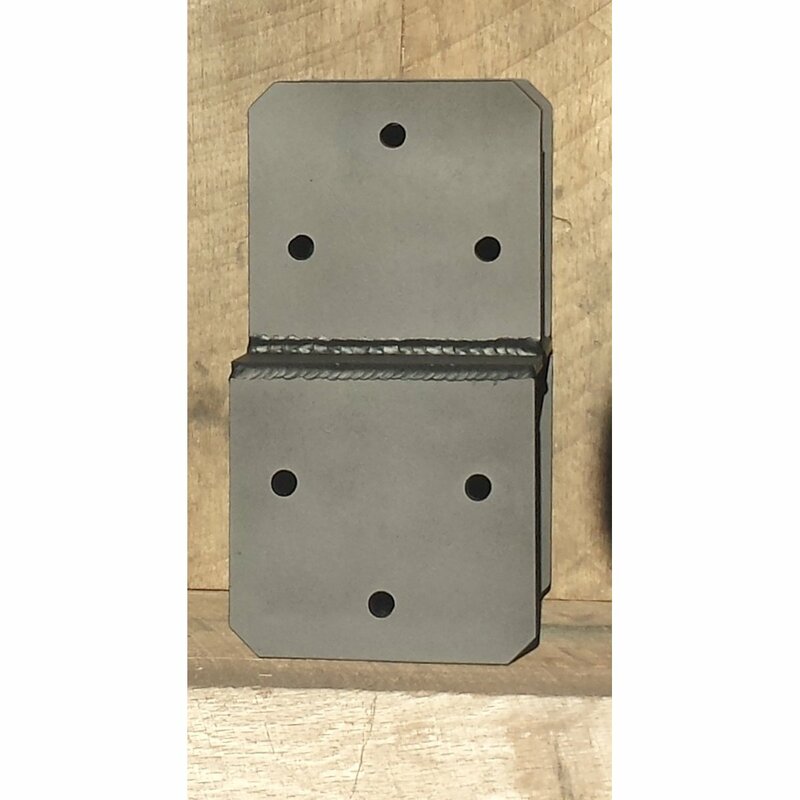 These particular swing set brackets have been given a hammered process for a decorative finish. 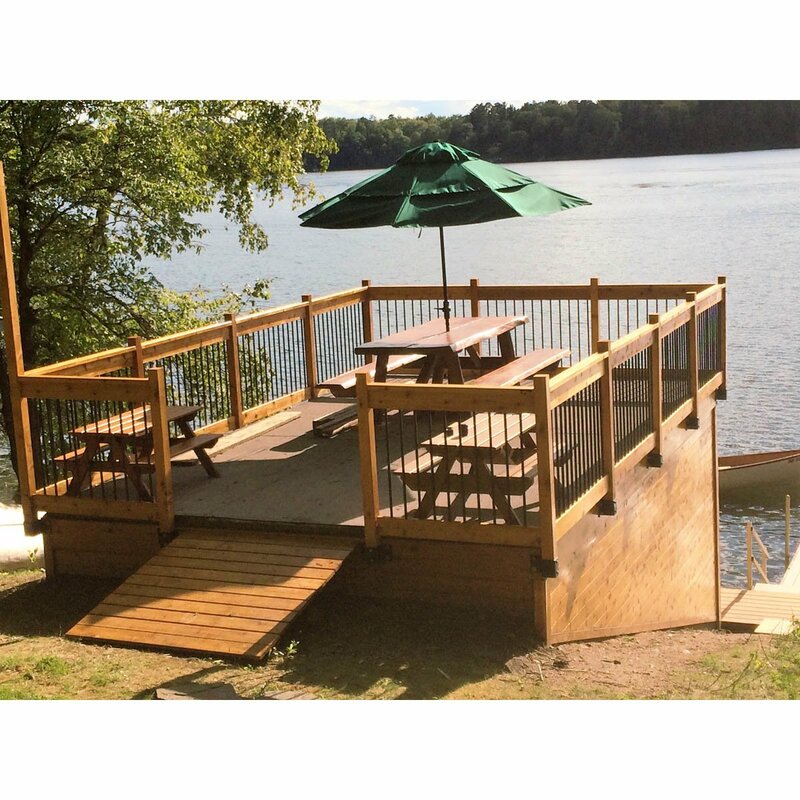 If you'd like to order some, give us a call at (715) 718-0781. 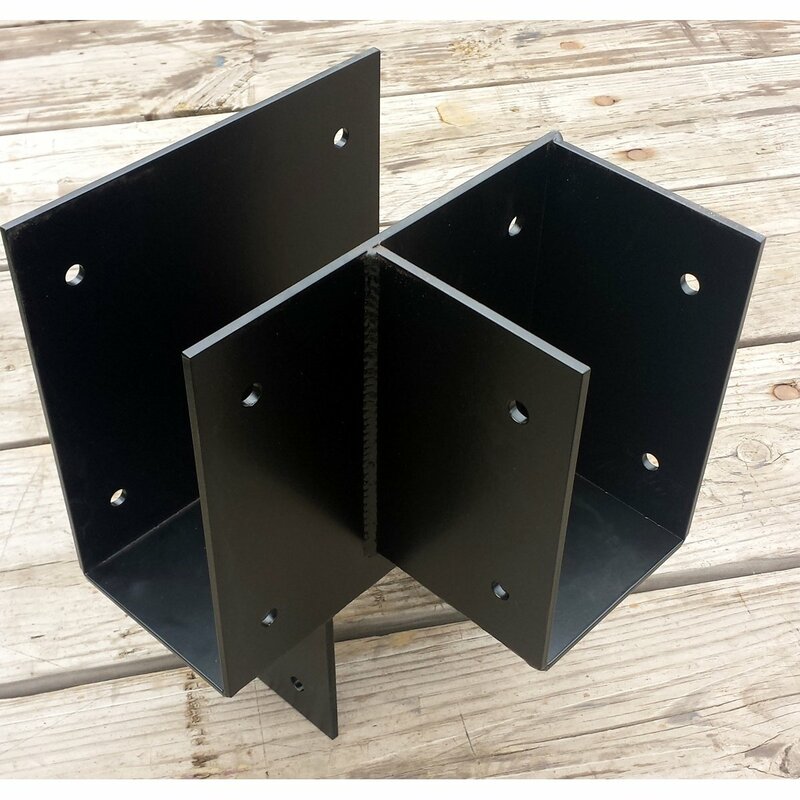 These steel brackets make a statement for your entry way to your home. 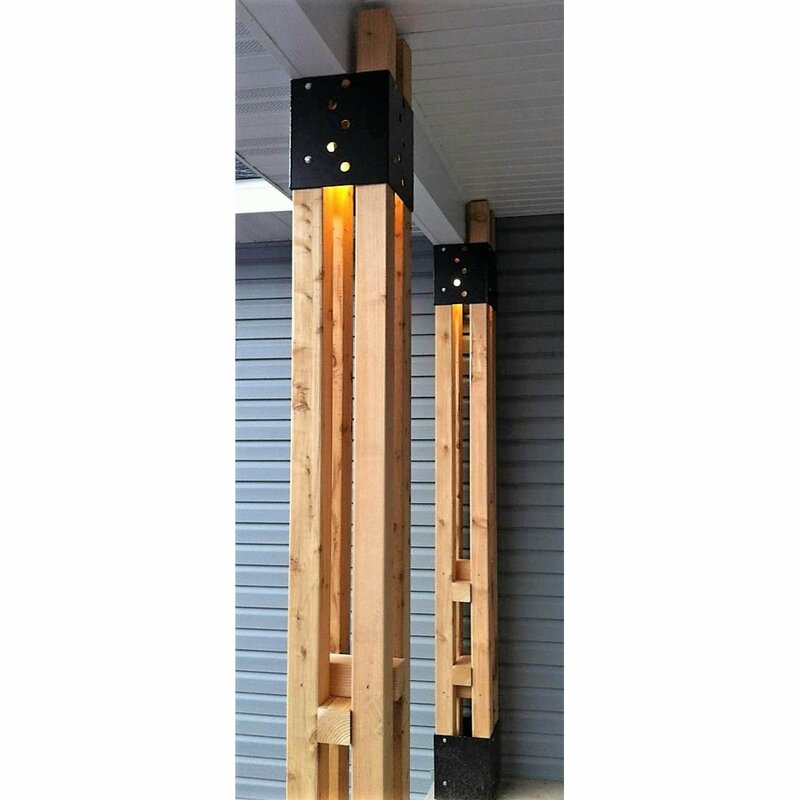 These are meant to be used with 4 posts, all together on the tops and bottoms to make an intriguing column that can be lighted to add ambiance. 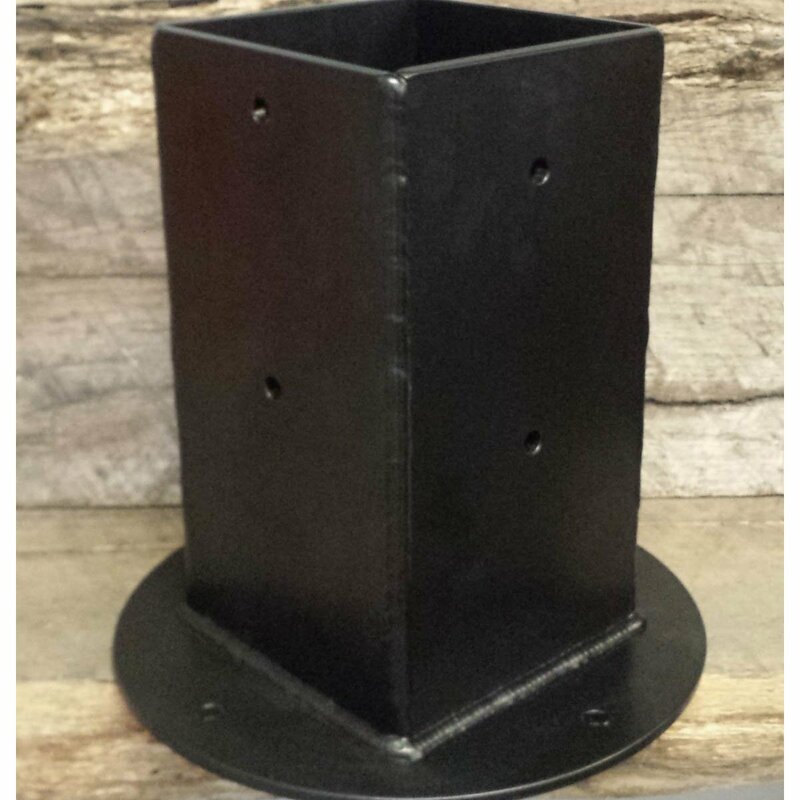 These column light brackets have holes punched out of them to allow light to filter through the holes. If you'd like to order some, give us a call at (715) 718-0781. 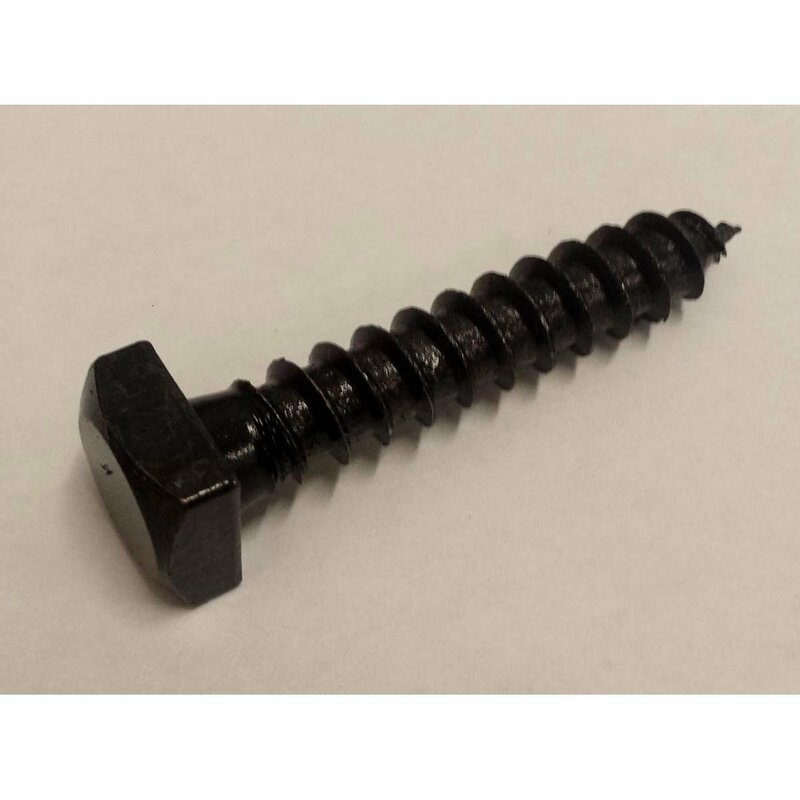 We offer square head lag screws for your building project because they really complete a rustic or industrial design. 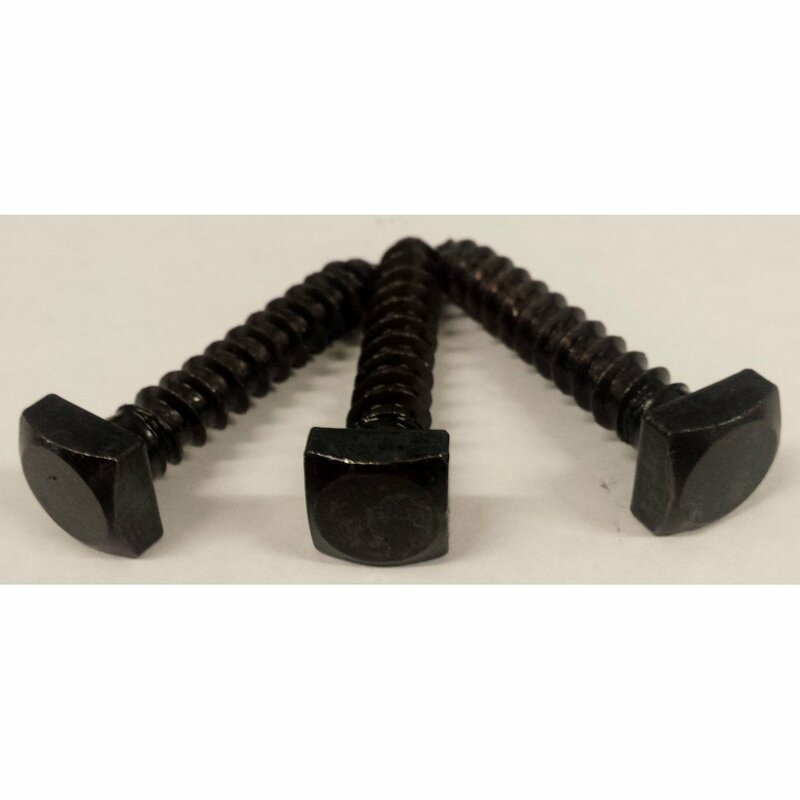 These lag screws are black oxide, unlike a typical zinc plated hex head screw. 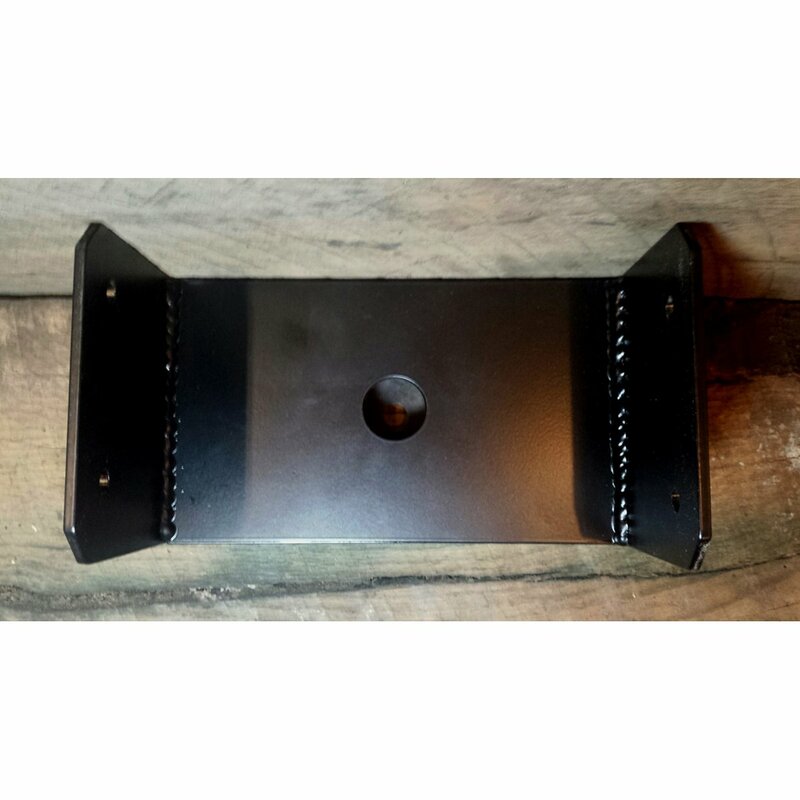 If you'd like to order some, give us a call at (715) 718-0781.